Welcome to Hong Kong War Diary - a project that documents the 1941 defence of Hong Kong, the defenders, their families, and the fates of all until liberation. This month marks the thirtieth anniversary of my arrival in Hong Kong. I’ve often mentioned it, but it was great timing! Back in 1989 everyone told me that I was wasting my time trying to research Hong Kong’s war: everyone was dead, no one wanted to talk about it, and anything written down had been burned to boil rice during the occupation. And in those days before the Internet propagated to most ordinary people, it seemed that I was the sole person interested in the period. Fortunately they were wrong. I had some lucky breakthroughs and discovered that there were plenty of survivors (then) still around, and they wanted to talk to me so their stories would not be forgotten. And family after family had kept diaries, letters, and all sorts of other documents. And for about ten glorious years this was the world’s only website dedicated to the topic, and everyone interested came straight to me! Now times have changed. The veterans are mainly gone, but there’s a growing and mature community of interest. Hong Kong’s war has gone mainstream. 28 Bob Tatz kindly sent me the wartime chapter of his biography to review. If the rest of the book is as absorbing as this chapter, then I am certainly buying a copy! Hopefully it will be launched in Hong Kong towards the end of this year. Among many other things, the story mentions the Church Guest House, which is only about five minutes walk from where I live. I’m always concerned that unimproved pre-war buildings like this will suddenly be demolished, so I went down with my camera and took a few photos. 26 Stephen Verrals let me know that the Royal British Legion and other ex-services associations have a project to place a Hong Kong memorial to Chinese servicemen at the UK National Arboretum. They wish to list on the memorial all the Chinese British Army units from 1842 to 1997. That’s a challenge, if we are to be sure that no one is left out. 25 Kathleen Crawford, RSM Donald Matheson, Royal Scots', daughter, let me know that her daughter is visiting Japan later this year for the rugby world cup and would be hoping to visit his POW camp. I reminded her that it was Osaka #1B. 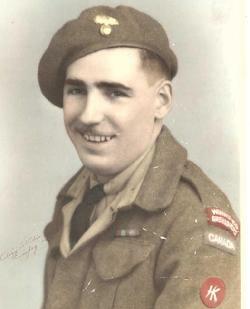 23 I heard today via Colin Standish that Doug Rees, Royal Rifles of Canada, had passed away on March 18. 21 Brian Finch, in his Lisbon Maru researches, has discovered an amazing story of a survivor of that vessel who married in Japan in 1945! But I won’t scoop him, as this is his own (rather exciting) work. 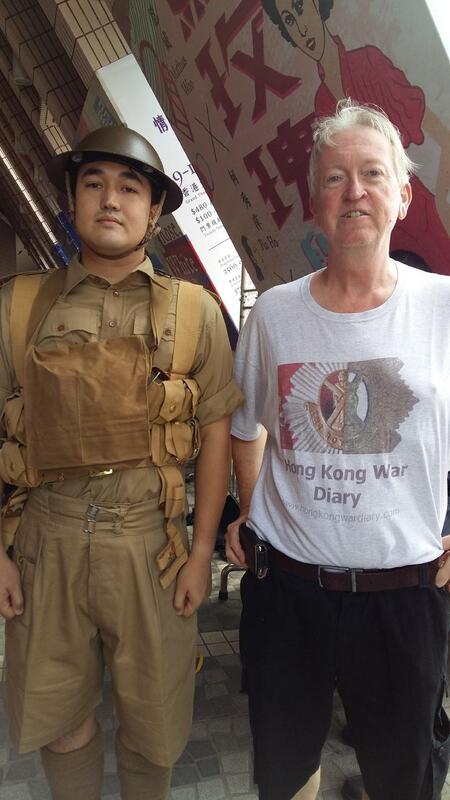 20 Just for fun I sent Alexander MacDonald a Hong Kong War Diary T-Shirt, and I was pleased to see him wearing it on a recent expedition to PB314 (where he is perched at the entrance). 20 Someone posted to facebook’s Battle of Hong Kong page a map showing the layout of the grid of air raid shelters under Leighton Hill, so on my way to work this morning I had a quick look. Starting from the side of the small HSBC on Leighton Road I found several of the entrances to be quite accessible. I took a quick photo of Portal 107 and when I have more time I should go back and walk round the entire hill and see how many are still visible in total. Also on facebook, someone else posted the best copy I have yet seen of the Japanese war artist’s painting of their attack on the Stanley Gap AA position. As far as I can tell, it is almost entirely accurate. 19 Today was the thirtieth anniversary of me moving permanently to Hong Kong. It is impossible now to calculate how my life would have turned out had I not made that move, but I am very glad that I did! 18 George Boote kindly sent me copies of two documents. One was ‘The Last Phase at Omine’ by Geoffrey Gordon Tyson (an Australian, not captured at Hong Kong). And the other was an excerpt from Blackwood’s Magazine of January 1946 called ‘Sweet Waters’ by Lieutenant John Gibson, D.S.C., RNVR, describing the liberation fleet’s entry into Hong Kong in 1945. The Omine work is purely paintings and sketches, the one of the ‘second food drop’ on the camp after Liberation is especially good. 18 Vic Ient gave me the welcome news that he is writing a book about his father, Albert Ient, Royal Corps of Signals, and his comrades. 16 Richard Moddrel kindly sent a photo of his father Peter Moddrel, Royal Corps of Signals, and colleagues dressed ‘on parade ‘Tenko’ Aug 1979’ taken in Blandford Forum, Dorset. 14 Bill Lake kindly sent Shaftain’s account (from Elizabeth Ride) of the negotiation with the Hong Kong triads to prevent them massacring Europeans as the Japanese attacked. 14 Brian Edgar notes that there may be a TV series about Emily Hahn, including her time in Hong Kong. 12 The HKVCA published their latest newsletter today. 10 The Researching FEPOW History Group (RFHG) have sent a reminder about their Workshop on 10 June 2019 at the Institute of Historical Research, Senate House (London). They will be covering diverse topics, including: Indian POWs of the Japanese, Jewish POWs of the Japanese, The legacy of medics in captivity (Bill Frankland and Cicely Williams), Australian Military Nursing and Internment, FEPOW memories and material culture, and Transgenerational stories, including experiences of camps in Singapore, Thailand, Japan and Sumatra. 10 Ron Abbott, referring to the photo labelled No 5 Section, No 2 Platoon Royal Scots in the January edition, notes: “Unfortunately, I can't make out the cap badge although it could be that of the Royal Scots based on approximate size and shape; but even then I'm not convinced that it is. The main problem is... these men are wearing kilts. With the exception of the Pipers in that battalion, nobody else wore kilts. Not the commissioned officers, not the warrant officers nor the rank and file. Only the Pipers... and they wore plain glengarries, not diced glengarries as can clearly be seen in this photograph. The only battalion of the Royal Scots in which all wore the kilt was a Territorial battalion, specifically the Dandy Ninth, e.g. the 9th (Highlander) Battalion, Royal Scots; and they were not in Hong Kong even in their amalgamated form as the 7/9th Battalion by WW2. Do you have any other information about the photograph?” Can anyone clarify? 9 Dave Deptford notes: “Via The Saleroom, ‘Police Medals’, by Charterhouse Medals, Group of 4 to A.B. Allan. Includes rare Hong Kong Naval Dockyard Police Long Service Medal to Allan, with Pacific etc. Blurb contains photo of him allegedly in Gordon Highlanders.” I assume this must be Divisional Inspector Alec Bruce Allan. 9 Like many other aficionados, I have pre-ordered Philip Cracknell’s Battle For Hong Kong 1941. 9 Brian Finch’s research has found a son of Garfield Kvalheim of the USS Grouper (the boat that sank the Lisbon Maru). When I knew Gar, he and his wife Fran had no children, but apparently he had children from an earlier marriage. 5 Colin Standish kindly let me know that one of the few remaining Royal Rifle of Canada veterans had passed away, Bill MacWhirter. 4 Bill Lake very kindly hand delivered my copy of The First Shall Be The Last (the Charter Stanley Camp diaries) to me today (illustrated). It’s certainly a massive volume! I will report back on it when I’ve finished. 4 Brian Finch kindly sent a photo of Norman Hendy’s (Sick Berth Petty Officer, HMS Tamar, RN) wedding day in 1934, with Norman Williams, acting as best man. 3 Last month I noted the passing of Peter Moss, and was delighted to see that Jason Wordie had written an obituary. I was a little surprised, though, to see that he didn’t mention that Robert Thompson was himself a Hong Kong evader! (Though it is perfectly possible that sub-editors might have deleted words for reasons of space). For reasons that will become apparent in a few months, I am very keen to establish contact with more people with connections to 1 Bty HKVDC. This month Leo Landau’s daughter got in touch, which was great. But I am still looking for more diaries and photos of this unit if anyone can help. Contact with the family of Captain George Fred Rees, CO of the Battery, would be particularly welcome – or any lead on their War Diary (if it exists). And on a second matter, I wonder if any sleuth out there can help find the family of Captain Rob Roy McGregor, USN, the captain of the USS Grouper (214) which sank the Lisbon Maru? You would think a captain would be relatively easy to track down, but I have had no success. 26 There are plans afoot for a proper memorial to the Lisbon Maru at the NMA. I will of course provide updates as the project progresses. 24 Steve Denton has proven that there is another mistake in CWGC files. They list Andrew Christie Black, 3054080, as being lost in the Lisbon Maru, whereas we can now show that this man was on the first draft to Japan and survived the war. The Andrew Black lost on the Lisbon Maru was in fact Andrew Thomas Black, 3054483. 20 Colin Standish kindly let me know that Fred Cooper, Royal Rifles of Canada, passed away in January. He also very kindly sent me a number of transcripts of interviews with veterans conducted by Chuck Rolands. 20 I heard today via Annemarie Evans that Peter Moss has passed away. He and Cyril Pereira (of the SCMP in those days) were the first two people to read and critique the original ms of Not The Slightest Chance. He will be missed. 16 Clare Makepeace notes: “I just wanted to let you know that my article on the war graves of British POWs who died while constructing the Thai-Burma railway was finally published this month.” While the subject is the railway, it includes mention of Arthur Basnett who was lost in Hong Kong. 12 Brian Edgar has found an interesting PhD thesis called The Life and Times of Percy Nettle, who was a Stanley Internee. 12 Martin Heyes notes that he has had a request from the daughter of Gunner James Edward Atkins, who was a member of 8 Coast Regiment, 30 Coastal Bty, during the battle. He also kindly attached a photo of Atkins. He asks what is the meaning of the group names under 30 Coast Battery in my nominal roles? Sadly, I don’t know! These were given to me by a relative of the CO and I don’t have a key. So if anyone knows (in this context) what 10s, PF, BCAs, Tels, BPR, Elo, etc. mean we would both be grateful. I can possibly guess some, but am looking for an authoritative answer. 11 Jennifer Lo contacted me to say: “I wanted to inform you that my grandfather, [last surviving HKVDC 3 Company veteran Sam Lo], passed away peacefully on February 8, 2019 at 10:27 am. He was 94 years old. His birthday was January 30, 1925.“ We were just in the process of arranging a war pension for him from the Hong Kong Government. 10 Steve Denton kindly confirmed that the Gunner Edward Arndle (RA, Lisbon Maru) on my website should in fact be Edward Arnold. The original mistake is in the CWGC records. 9 The BAAG facebook page is really gaining momentum, with many interested parties (including families of BAAG members) continuing to join. 8 Anne Ammundsen (Captain Bob Newton’s, Rajputs, niece; Bob was killed by a mortar outside North Point Power Station), kindly let me know that the family has written up: “the transcripts (done by his brother, Roy) of Bob's letters to his parents - written from both India and Hong Kong during the course of WWll. The booklet is 74 pages long,” She has sent me the full set. 8 Leo Landau’s (HKVDC) daughter got in contact. She mentions her father’s wartime diary, which sounds very interesting. 8 Elizabeth Ride kindly sent the new BAAG group four photos of banners painted at post-war BAAG reunions in the 1950s. Some names are in English and very familiar: I see ‘D Hunt’ and ‘M Talan’ for example), but most are in Chinese. However, this is very useful as the transliteration of Chinese names to British in those days was pretty irregular, and in practice the Chinese versions are fare more useful. 7 David Beningfield kindly sent a pre-war photo of his father (William Beningfield) in uniform. 7 Bill Lake kindly informed me that there is indeed a second plaque on the St John Ambulance memorial, and kindly sent me a photo. With the help of these plaques I have updated my records, but am left with far more questions than answers. While anecdotally I know that many of their 56 deaths occurred in Wong Nai Chung Gap and Stanley, I don’t know firm details of any – and suspect many more deaths occurred during the occupation. But one name really stood out, Ambulance Sister Katima El Arculli of the Victoria Nursing Division. El Arculli is a name famous in Hong Kong history, and the family is still very influential today. I am very surprised that I can’t find details of Katima anywhere. I find it most difficult to write to you to tell you how truly sorry I am that you have lost one of the best and most gallant of husbands. Your husband was killed going out to see what had happened to a patrol which the G.O.C. had ordered to be carried out at all costs. At the time he was in command of a mixed detachment of Middlesex, R.A., and R.S. none to easy a body of troops to handle, in the neighbourhood of Canal Rd East close to the Happy Valley. He had handled his command with great gallantry and I placed the utmost reliance on his judgment. He was a grand example to my men. Until the fatal night he had been attached to my HQ and had shown himself a most able and reliable officer. I find it most difficult to believe he has gone. As you know he was slightly wounded by a bayonet wound in his leg and I was glad to be able to send him to Bowen Rd to see you that night. I know, from the very little he said to me how fond and proud he was of you and you can rest assured that no one but you was ever in his mind. Speaking personally I have lost a hastily made friend and my sympathy in your irreparable loss goes out to you. He also kindly attached a photo of Mackinlay. 6 Today I finished my first draft of an attempt to calculate how many of Hong Kong’s population as at December 1941 perished before liberation. There is still some tuning up to do, but it seems possible to establish a credible range of 300,000-340,000. I am hoping this will be published by the Royal Asiatic Society. 6 As is now my tradition on the second day of Chinese New Year I set off on a longish walk. Conduit Road to the top of Jardine’s Lookout, via Bowen Road and Park View on the way there, and Black’s Link, Coombe Road, Barker Road, and Chatham Path on the way back. On the way I stopped at the St John Ambulance Memorial at Wong Nai Chung Gap and discovered that the memorial plaque to those lost in the war really is there (as Anne Ozorio had told me). But only 37 names from their 56 fatalities were listed. Perhaps I missed a panel? Later I saw that there was a new wreath on the Osborn Memorial on Jardine’s Lookout itself, that someone had cleared the vegetation from the Artillery OP at the top, that the big typhoon last year had cleared trees blocking what looks like a second tunnel entrance to PB3 at the bottom of Black’s Link, and that what may be a ‘new’ Japanese tunnel had become visible at the top of Black’s Link (just up hill from where the buildings end). 5 Brian Finch kindly sent a newspaper report from the Liverpool Echo of 9 June 1950 of Bill Evans’ death. Evans was one of the three men who not only survived the Lisbon Maru, but evaded recapture. I have long known that he was assassinated by mistake in Vietnam, but these credible details are new: “Mr. A. K. W. Evans, English inspector of the British American Tobacco Company, was shot dead last night in Saigon by Vietminh terrorists, who also shot and killed a Vietnamese policeman. Police believe the terrorists mistook Mr. Evans, aged 47, of 12 Crown Crescent, Scarborough, for someone else. Mr. Evans arrived in Saigon from Djakarta last month, and was driving the French assistant manager of the tobacco company, M. Maurice Lebas, and two friends from the factory at Cholon. They were stopped by a group of four Vietnamese, including a girl. The men in the group opened fire with automatic pistols. Mr. Evans was shot through the head and died instantly. Lebas was wounded twice in the arms. The killers escaped in a waiting car, but were challenged by a Vietnamese police patrol. The police opened fire and the Vietminh men replied, killing one policeman. The car vanished in the traffic. The Franco-Vietnamese Surete has launched an extensive search. Mr. Evans, who left Britain last January, leaves a widow, a French-woman, living in Saigon. Mr. Evans had no children. He represented the British American Tobacco Company in China for many years. He is a member of a Bristol family, and is a brother of Mr. E. P. Evans, secretary of the Scarborough Rugby Union Club. He was in Scarborough on leave last year, and was expected on leave again in August - Reuter.” Just as a side note, the only other ex-Hong Kong POW I know who was killed in Vietnam was ex-Winnipeg Grenadier John McCoy, who was in fact an American and later volunteered for service in the Vietnam War as a Ranger. He was killed in a firefight there in the mid-60s. 3 George Boothroyd’s (RN, Lisbon Maru) great nephew got in touch. 2 I set off on my usual route up the hills early this morning, and almost immediately came face to face with a Masked Civet Cat on Hornsey Road! Our older son was staying with us over the summer and said he often saw them there, when running at night when the temperature dropped. Later on the same walk, on Chatham Road, I found another porcupine quill. I keep a little glass of them now, in my study (illustrated – which might give you an interesting view into a corner of my study!). 2 Blacksmiths Books the publisher, kindly sent me a copy of Paul Letters’s book The Slightest Chance today (can’t think where he got the idea for that title?) I’m not a huge fan of historical fiction, but it’s getting good reviews and knowing Paul I am sure the research behind it will be spot on. 1 Bill Lake was kind enough to inform, me that the January 2019 update of this website failed again. I still don’t know what the bug is, but seem to have found a workaround which incorporates using on browser to edit the site, and another to publish it. 1 I saw today (via Elizabeth Ride) that Gwulo has – with her help – put together a very useful starting list of BAAG agents, together with other information. For some time Elizabeth Ride, daughter of Brigadier Sir Lindsay Tasman Ride, CBE, has suggested that the various ‘friends and families’ of BAAG (the British Army Aid Group) should get themselves together into an Internet-based community like the Stanley Group or the Battle of Hong Kong facebook page. As a result, a few of us have helped create this page. The steering committee has also had its first meeting (see the photo: from left to right Sandra Lau, Bill Lake, Dennis Cheung Tsun Lam, Rusty Tsoi, Dr Chi Man Kwong), and content has started to arrive. Please feel free to take a look. 29 Today I saw a British newspaper report about a restored Japanese Type 95 tank. I’ve seen wrecked ones on remote Pacific islands, but this one is in working order. I believe this is the type the Japanese used in their attack through Tai Tam and down into Stanley where they ran into the two pounders of the HKSRA 965 Defence Battery. 26 A lady in the UK has started a formal petition to the UK government for 15 August to be a national day of commemoration to remember those who fought in the Far East, and the POWs in particular. Those interested can see details and sign up here. “Can't remember if I told you this already but it is really funny. Do you recall I told you about the two old boys I serve and one was on the railway and the younger of the two was stationed in HK post war for many years, he told me he had a book for me to read and it transpired it was yours? Well here is a rough account of him bringing the book in. ‘Good Morning boys, how are you both?" 24 Another interesting set of photos via Brian Finch today, this time from George Robins of the Middlesex showing the Cricket XI and a tablecloth made of silk webbing from a parachute – believed to be from food parcels dropped into camp by the Americans. Also, from John Inglis RA, a fine portrait of X Heavy Battery, HKSRA (Inglis is second row from bottom wearing glasses – seventh from left), and a very atmospheric photo of the Gale family (the father, Edward Gale Senior, has his right hand on the shoulder of John Gales, and his left hand on that of Edward Gale, who was on the Lisbon Maru with the RCoS. The boys’ sister Margaret is standing in front of Mrs Gwenllian Gale). This photo is a reminder of how much tougher was for most families in those days. I recall a Lisbon Maru survivor telling me many years ago that pre-war he was sent down a coal mine at the age of fourteen with no training or safety equipment, and after that experience nothing in his life really frightened him again. Finally, he included a rather fine photo from Matthew Smith’s (Royal Scots) family of number 5 section 2 platoon. 23 I emailed Ray Barman today (son of BQMS Barman of ‘Resist to the End’ fame), but was very sad to receive a reply from his wife saying that Ray had passed away in February 2017. 21 After a gap of some years I am back in contact with Maltby’s grandson. Among other things he asks: “Did you ever see the Chinese film ‘Love in a Fallen City’? A love story between a Hong Kong Chinese couple during the invasion. Unfortunately no English subtitles or dubbing available but an interesting enactment of the Peninsula Hotel siege with actual military characters who do speak English. Grandfather is seen at the end embarking on a launch over to Kowloon Side to surrender the colony.” It sounds interesting. Has anyone seen it? 21 Today I received the awful news that Glenis Devereux had suddenly and unexpectedly passed away. I was emailing her just a few days ago. Her father - John Michael Devereux, who survived being shot in the face during the fighting - was a sergeant in the Royal Scots. 21 Via Brian Finch I have an interesting schematic of Kobe House drawn by Alec Smith, RE. 20 Leslie Coxhill’s (HKVDC) son got in touch, kindly sending images of a menu (from Hiroshima #5B, Innoshima, POW Camp). The menu is largely written in faux French, making fun of the Japanese, and it is signed by twelve other POWs. The only thing I don’t understand is that it is entitled ‘Victory Dinner’ and dated Tuesday October 24th, 1944. What is significant about that date? 20 I received a sad and totally unexpected email from Bob Tatz today: “I was devastated at the news of [Ruth Sewell-Baker’s] death on New Years Day, and would like to share this with you. I am so thankful that Ruth and I reconnected after a gap of 73 years when I visited her in Oxford in 2016, the same year that I visited Barbara Anslow. The following was the announcement I received from her husband Roger: Ruth died peacefully on 1st January in the JR Hospital, Oxford, having had a totally unexpected severe stroke at home the previous night. Her memorial service was held today, Saturday, January 19, 2019.” Better news, though, is that Bob’s memoirs should be published later this year. 19 1 Battery HKVDC were all but wiped out in the battle of Stanley where they held the frontline on Christmas Eve. But has anyone ever heard of a War Diary? Or have had contact with the family of the Battery’s CO, Captain George Rees? I would be grateful for either. 19 David Kyle’s (Royal Engineers) daughter kindly contacted me today. Sadly she noted: “Just to inform you my father David Kyle, Army number 1874148, 22 Fortress Company, passed away 31st December 2018, in his 100th year. Dad was in Hong Kong until the surrender to the Japanese, he was in Shamshuipo Barracks, until 1942 then transferred to Japan, Kawasaki 23-D. His POW number was sapper 228.” She kindly sent a couple of post-war photographs of him. 18 A small group of like-minded people have created the BAAG Descendants and Friends Group of facebook. They published the minutes of their first meeting (last might, at the Police Sports and Recreation Club in Mong Kok) and kindly sent me a photo. 18 This evening Crown Wine Cellars held a party to celebrate the renewal of their lease on the Little Hong Kong premises. Unfortunately I couldn’t attend, but I was very much cheered by the news! 16 I had an extremely interesting call with a UK documentary company this morning. I hope the unusual project they are working on comes to fruition! 15 Colin Hodgson’s (Royal Corps of Signals, Lisbon Maru) son got in touch. 14 I received the latest Java journal today and was very pleased to see three Hong Kong related stories there. They published an article on Barbara Anslow’s book (already into its second edition! ), another on Ron Freer, and a third about Bill Macauley. Ron was an early victim of Shamshuipo’s diphtheria epidemic, and never really recovered. But what I hadn’t known until recently is that his father was killed in the Great War. Admittedly Ron is 103, but even so it seems amazing that someone with that background should still be with us. And long may that continue! 12 Old friend Tan got in touch to say: “I saw your post about the searchlight of Collinson Battery damaged by typhoon. I went there to check the damage as I just visited the site a year ago. I am so shocked to see the damage caused by the typhoon. The solid concrete structure standing around 10 meters above sea level over 70 years smashed in to pieces. Most unbelievable is the left searchlight completely disappeared! All the remaining structures are gone and only the clean base left there. The road connecting to it also disappeared! I attached a photo I took before to show how the structure looks originally for you to compare. Typhoon Mangkhut really caused huge damage to HK coast.” His before and after images really are amazing. Tan also sent me photos of other damage around the coast to a variety of wartime structures; I wish he was in charge of Hong Kong’s heritage! He also shot some very interesting drone footage of the impact of that typhoon. 11 Today there was a Canadian Ministerial visit to Saiwan. The Consulate asked me to accompany them, but (I think for the first time) I had to turn them down as I didn’t have enough notice. It’s a shame as I really enjoy helping out when I can, and it’s a privilege to get to meet such interesting people. I hope it went well. 8 My ex-publisher from Hong Kong University Press (Dr Colin Day, to whom I owe a huge debt) and his wife are visiting Hong Kong, and I met them both very early this morning for a very enjoyable walk around the Peak. 8 I discovered today that my PhD thesis about the 1940 evacuation of ‘British’ women and children from Hong Kong is now available on the Internet. 7 Today I heard from the family of evacuees Barbara Ellen Hayward and Richard Twyman Hayward, aged 13 at the time. He had been born in Hong Kong in 1927. His father was Allan William Hayward, Captain of the Hong Kong Cricket Club, who apparently died in Burma in 1943. 7 A lady in Northumberland sent me an unusual and interesting email: ”I love vintage things and so my mum bought me a vintage evening bag from a Charity shop in Sunderland, Wearside, England. It looked 50s in age. Upon using it, I realised that it had a bank note in it. This looked like Monopoly money! I passed it onto my twin boys to play with/put in their ‘odds and ends’ box. The next day I was curious as I realised it could be used to date the bag possibly. To my surprise I think I have an original 1941 bank note which I believe to have been issued between Oct 41 and Dec 41.” It certainly looks like a genuine note. Now, my wife – if she gives someone a purse or bag – always puts a small bank note in it for luck. Perhaps that’s an old tradition? This may well have been a gift from pre-war Hong Kong. 5 I hear that the Al Jazeera short about Crown Wine Cellars is out. Here is the link on YouTube. 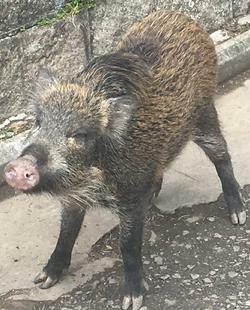 5 This morning (as we often do on a Saturday) my wife and I walked along Bowen Road and climbed up to Wanchai Gap, seeing another four wild boar in the process. 4 Walking home from my annual medical examination at Matilda Hospital I came across a wild piglet (illustrated) and her much large dad! This was on Homestead Road, and they were both so tame I think someone must be feeding them. 3 Phillip Cracknell posted a fascinating blog about Brigadier Jack Reeve, who commended the Hong Kong infantry immediately before the Japanese invasion, leaving the Colony in November 1941. I am ashamed to say that I had never heard of him before. He also posted a second one, covering the story of Captain Douglas Baird, Royal Scots, who survived the Lisbon Maru. 1 Sylvia Midgett put a 1950 newspaper advertisement for ‘Told In The Dark’ on the Battle of Hong Kong facebook page, showing the original price of HK$3.50. I buy copies of every book from this period of Hong Kong’s history that I ever hear of, but this was one of the hardest to track down. Eventually, perhaps ten years ago, I found my copy via Sotherans, and it cost a small fortune. 1 Steve Denton kindly sent a link to an account of the sinking of the Lisbon Maru by Alf Hunt. First of all, apologies for the late publication of last month’s update. I actually hit the ‘publish’ button on time on the last day of November, and didn’t realize that anything had gone wrong until TK Wong kindly let me know. Apparently I hit a bug in the software which I use to update the site each month. That was a surprise. Fifteen years ago I hit bugs quite often, but it has been very stable since then. Hopefully all’s well this month! 31 Philip Cracknel has published a nice article about Captain Norman Cuthbertson, Royal Scots, who was genuinely heroic aboard the Lisbon Maru. 31 Research by Brian Finch makes a very strong case that Edward Upton, RE, died of diphtheria in the first hold of the Lisbon Maru before she sank. Previously I was only aware of two naval men who shared that fate (with Beri Beri being their cause of death). In a letter to Upton’s widow, his CO Lieutenant William Clarkson states explicitly that he died in the hold and was carried up to the deck and buried at sea. 30 From information supplied by Brian Finch, it appears that the Plymouth Naval Memorial (which I have never visited) has a panel or panels dedicated to the Hong Kong Royal Naval Volunteer Reserve. That had never occurred to me before. I had assumed that all the lost naval men listed there would simply be in rank and alphabetical order. If anyone has a photo, I would be grateful. 29 Jennifer Lo (see last month) kindly sent me a contemporary photo of her grandfather, HKVDC and 3 Company veteran, Yau Sam Lo. 29 Kent Shum kindly sent me the Chinese poster advertising Fang Li’s new Lisbon Maru documentary. 27 Bill Lake has confirmed that the Charter Diaries are now published and available. I know this has been a lot of work, and am very much looking forward to reading my copy. 23 Today I received an email that truly made my day: “Dear Tony, I want to thank you so much for first contacting me many years ago, and drawing me into the Stanley Group on line, because without that happening, I would not have met up with David Bellis and my war diaries would never have been published. This has been the most exciting year of my life! Regards and God bless, Barbara (Anslow).” As Barbara is one of my heroes (or heroines, to be more precise), it’s rather a big deal! 22 Today the CWGC put an old photograph of Sai Wan on facebook. Taken in 1954 it shows the cemetery before anything around it was built up. Interestingly, at mid left there are three clearly defined 500-pound bomb craters. In one of the comments, someone posted this video of me taking Canadian Prime Minister Justin Trudeau around the cemetery at the end of 2016. We appear at about 01.26. 20 John Lomax’s (RA) son got in touch. 20 Elizabeth Ride (and others) have suggested that there should be a BAAG social media group (on facebook or whatever) in the same manner as the Stanley Group and the Battle of Hong Kong group. I think it’s a great idea, and hopefully we can kick it off early in the New Year. 19 George Boothroyd’s (RN, Lisbon Maru) grandson got in touch. 14 Al Jazeera interviewed me on camera today for a documentary about Crown Wine Cellars. 14 Old friend Rob Weir was in Hong Kong again recently and took a closer look at PB14. He notes: “The Lyon Light Shelter shows obvious signs of shrapnel damage within the structure, consistent with reports that fighting took place there - in some form. The accessible outer walls of the PB, and a quick peek inside through an open loophole, showed no apparent battle scars. On this visit, I was able to get inside and have a good look. Apart from some damage apparently caused by probable squatter residents over the years, there is no apparent battle damage within the main compartment of the PB. As I mentioned previously, this PB is a little different to most of the other Beach PB’s in that it has an extended entryway along the left side. This is only obvious from the inside as the area is completely covered by a landslip externally. On the side of the entryway, opposite the entry to the main compartment is a large, roughly circular, hole. This has been filled with carefully laid stones and rocks, and is limited to one area rather than the whole side collapsing from the landslip. My theory is that it was caused by an explosive charge set against the outside wall. That could explain how the crew were overcome without fighting.” Rob included a few photos, but unfortunately it was so dark inside that they don’t meet this site’s (ahem) ‘high standards’! 12 Does anyone have the contact details for Iain Ward, author of Sui Geng: Hong Kong Marine Police, 1841-1950? Asking for a correspondent. 12 The HKVCA have published their latest newsletter here. 10 Phillip Cracknell has posted an interesting blog about Eugenie Zaitzeff’s description of life in Japanese Occupied Hong Kong. He also updated his account of ARP Director Wing Commander Alfred Horace Steel Steele-Perkins with some fascinating new photos (illustrated). 8 Frank Hinge’s (RN, Lisbon Maru) grandson kindly sent a photo. 8 In answer to the question (see last month) of supplying food to frontline troops, TK notes from his study of the RASC and RCASC, that: “They (both Eng. and Can.) emptied the Central Depot at Queen's Road and dumped foods to various food stores in the hills across the island - Stanley, Wanchai Gap, Quarry Bay, Aberdeen, Chung Hom Kok etc. on the first two days of the battle. The new depot at Deep Water bay fed 59 units of around 10,000 men. They baked 8,000 to 14,000 lbs of bread per day up to almost Christmas Eve. They were required to make numberless issues (food) to even small units and sub-units, very often having a ration strength of only three or four. On the 21st they used mule transport to carry food to exposed hilltop positions. Those emergency food stores were quite near to the fronts and the soldiers could get tinned beef, corn, vegetables, and milk when hot meals were unavailable.” Although this is about Hong Kong Island, I imagine it was similar in the New Territories. 7 I was working in Bucharest this week, seeing snow fall for the first time in many years. And at breakfast today I was informed that in my ‘real job’ I will now be reporting directly to Larry Ellison for a period. Unexpected, and good in some ways, but unfortunately likely to eat into the little free time that I still have for things historical. Keats, Dorothy – In Stanley internment camp with her whole family. Apparently one of the Rays was a big noise in Hong Kong’s film community, after which the Ray Theatre was named (from Gwulo: Address: 102 Third Street, Sai Ying Pun, Hong Kong. Truelight Building is the current occupant at the site. Ray Theatre operated during the period February 6, 1951 - March 1, 1971). 4 Yau Sam Lo’s (see last month) granddaughter kindly sent me an account of his life. Interestingly she notes that when he was first in POW Camp: “My grandfather’s two older brothers also came to visit him every day. They knew how to speak Japanese and they paid money to the prison guards so they could bring food for him.” Her great-grandfather had been the President of Business Association for Taiwan, doing business with the Japanese, so the family knew how to speak Japanese. 3 Ivor Arthur Gale’s (RAF) grandson got in touch. Unfortunately his ‘reply to’ email address was incorrectly set so I could not reply. So Leigh Gale, if you read this then please fix it and try again! I am particularly interested as I have had so few contacts from Hong Kong’s RAF families. 3 Brian Finch sent me something I hadn’t seen before: a civilian casualty card for the Royal Marines / Royal Navy. This one was for Charles Collard’s (RN, Lisbon Maru) wife, with a rather endearing misspelling of his name. I hadn’t considered this aspect of war before, but of course servicemen would need to be informed if family were killed in air raids. Collard served on HMS Cicala, and while playing around on the web this month I came across a ‘new’ and rather good photograph of her. 3 Tai Hang Wong noted that yesterday he hiked the treacherous section of Maclehose Trail between Kowloon Pass and Sha Tin Pass which was part of the Gin Drinker Line on the south side of Lion Rock Hill facing Sha Tin Valley. He adds: “The following few pictures taken by Francis Cheung may be of interest to you. One of them shows a concrete military marker of the Gin Drinker Line. It is quite worrying to find the three original military markers in that section not being protected by any preservation measures at all, subjecting them to the damage of nature and vandalism. In fact the inscriptions on the one next to the display board that mentions the BAAG history is seriously worn out and illegible.” Of course this isn’t unusual, and generally the government is good at fixing or replacing defaced boards. 2 Today we celebrated the annual Canadian Memorial Service at Sai Wan. There was, as always, a good turnout and it was great to see many friends. Mike Babin from HKVCA was there as usual and we had a brief catch-up. Had a long chat with Bill Lake who is studying Helen Ho and her sisters. I immediately told him that I had a copy of a ‘thank you’ letter sent to her upon liberation by the senior officers in Sham Shui Po, but when I got home I couldn’t find it. I found copies for May Huang and Joan Ip, but can anyone lay their hands on Helen’s? To me the awful quality of the copies of these letters just adds to their value. The POWs owed such a huge debt to these ladies (who somehow got food and other things into the camps) that they were determined to show their appreciation whatever the technical difficulties! 1 Barbara Anslow’s one hundredth birthday! I have probably noted before that thirty years ago when I first started studying this period in Hong Kong’s history, I came across Barbara’s diary quoted in secondary sources as if it was an ancient document. Little did I suspect that I would meet Barbara and her family and be corresponding with her to this day! And it’s not just me; she has generously given her time and memories to the whole community interested in those days. 1 Correspondence continues with Ken Salmon (son of Andy Salmon, RA, Lisbon Maru) who I met in Hong Kong last month. Of his father’s first wife (nee Martha Gomes) he notes of the 1940 evacuation: “she was heavily pregnant at the time and was disembarked in Manila where she gave birth to a baby daughter before continuing on to Australia, eventually settling in Sydney until after the war. Sadly, after reuniting with my father in Sydney, they returned to HK where Martha passed away in May 1950, aged 31.” Very sad, and what a challenge for a 21 year old to have a first child, by herself in a strange country like that. Donald Neal success in retrieving the records of an HKVDC officer from Kentigern House (see the sixteenth) is very encouraging. He has kindly sent me the contact details of the people who helped him, and I will follow up with them. Up till now I thought that these details were not available in the UK (and so far, of course, I don’t know how comprehensive they are). 27 I received notice today of a new peer-reviewed journal whose inaugural edition includes an interesting article on fifth-columnists in the 1941 fighting in Hong Kong. 27 Kai Chiu Hung’s (3 Coy, HKVDC) great nephew got in touch. 26 The Researching FEPOW History Group has announced their next one-day workshop on 19 June 2019, and a two-day conference 5-7 June 2020. 26 On my way to San Francisco today I had a very enjoyable meeting – at the airport as all parties were flying out at roughly the same time – with Viveka Melki and Chi Man Kwong. 20 William Cambridge’s (Royal Navy) nephew got in touch, kindly sending photos. 19 Brian Edgar has written this very interesting article about wartime collaboration (and its lack). 19 Rob Weir notes: “Visited PB 14 yesterday and, probably because of the typhoon, managed to get inside for a decent look. It is a strange beast: a standard two loophole ‘bent’ front beach PB, but it has an external air void running down one side and across the back, only ever seen before on one other in a photograph, and the access on the other side being through an extension which puts the entry at the front adjacent the loophole. This ‘annex’ seen in a slightly different form on the Tai Tam Junction PB. The combination of both must be pretty unusual. This must have made life interesting for the LL crew, as they would have to cross the front of the PB to reach the access steps, which are immediately adjacent the opposite side of the PB. No way could you get around the back.” I haven’t been there since I visited with Jim Thompson and the then CEO of Ocean Park around eight years ago. 18 Martin Heyes notes that he visited Stanley Military Cemetery just after the typhoon hit and found that one tree had come down. He and Philip Cracknell kindly sent photos of the damage caused, which the CWGC is rectifying. 18 Not strictly related to the second world war, but on one of my regular trips to the summit of High West I see the government seems to be fortifying it! 16 Don Neal tells me he has been successful in getting the HKVDC service records of Colonel R.D. Walker from Kentigern house. 16 On the FEPOW facebook page, Lisa Bates posted photos of Charlie Bentham, RE, who was one of the ‘hard men’ shipped to Tokyo on the first draft of POWs from Hong Kong. He looks about 16 on enlistment, but considerably older and wiser when pictured as a POW. 15 Arthur Alsey’s (Royal Scots, Lisbon Maru) daughter sent a number of interesting photos of her father via Brian Finch. One of them (illustrated) clearly demonstrated the famous shorts! Normally I am not reporting Brian’s work in detail as it is all bound up in the Lisbon Maru documentary project, but Arthur’s name is so familiar to all readers of Barbara Anslow’s diary that I thought I should mention it. 15 Brian Finch continues to do sterling work on the Lisbon Maru families. Thanks to his efforts and continuing contacts through this website I now have photographs of 222 of those who were on board. Among some photos not directly related to the Lisbon Maru were a set showing Lance Corporal John Weaver, Middlesex, at the border with China, and another of Corporal William Holland, RCoS, and friends. “Top row: A.P. 'Chunky' Xavier, Henrique 'Ariri' Noronha, Eduardo A. 'Dicky' Noronha, Arthur Basto, Robert A. Souza, Leo A. Souza, Alfred J. M. Prata, E. J. 'Turibio' Cruz, J. M. Jesus, George Ablong. 2nd row: Marciano Silva, Benny Marçal, F. W. Reis, 'Tonin' Sequeira, Tommy M. Castilho, Caetano M. 'Gaita' Azedo, J. F. D. Ribeiro, Darius C. Alves, José A. Marques, Pepe Baleros. 3rd row: Carlos 'Sluggo' Soares, David Leonard, E. A. V. Remedios, Norman Leonard, Henrique Ribeiro, Richard Silva, Harry Mathias, António F.'Butter' Noronha, Freddy Rocha, Carlos 'Sonny' Rocha, Cezar A. Roza, Hugo Garcia, E. J. Figueiredo, Augusto 'Gussy' Sequeira. 4th row: Leo R. Campos (standing), C. A. J. Ribeiro (standing), Luiz Xavier, A. C. Neves, José M. 'Zinho' Gosano, Carlos 'Chodas' dos Remedios, A. M. Baptista, Dr. Patrick M. Cmeyla (U. S. Army), J. C. Remedios, António C. 'Tony' Barretto, Robert J. 'Bob' Barnes, A. Cruz, Luizito Remedios. Front row: M. A. Larcina, Roberto Silva, G. S. Edwards, 'Alichi' Ribeiro, E. S. Marques, Roque Silva, Aquiles V. Jorge, Hugo Ribeiro, Henry Souza, Cicero Rozario, A. B. 'Tony' Carvalho, Billy Wilkinson (squatting), António M. 'Smoky' Xavier (on one knee). 12 Charles Dobie kindly noted: “I found a 48-page illustrated booklet (half English, half French) published in 2005 by Veterans Affairs, Canada. 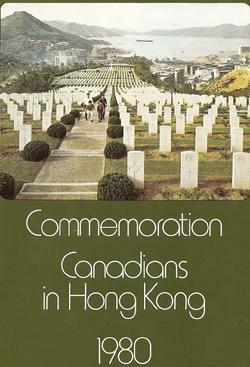 It gives a short history of the Canadian Forces in Hong Kong during the invasion. If you don't have a copy I'll drop it in the mail to you. It is ISBN 0-662-68645-4.” I don’t think I have seen this before so am looking forward to receiving it. 11 A Buffs (Royal East Kent Regiment) shoulder flash turned up in the hills today. The only problem is that we don’t know whose it was. Of course it could have been lost pre or post-war, but perhaps most probably it belonged to an officer on the General List who was here during the fighting. But I don’t know of any of them from that Regiment (Neve, of course, was Royal West Kent, but that’s a different thing entirely). 10 Apparently some experts (see last month) believe that the true number of trees lost to the great typhoon could be as many as 100,000. 9 Steve Denton kindly sent this link from the Telegraph about Ron Freer (see last month). Everything seems about right except that of course he was not aboard the Lisbon Maru. 9 A reader sent an interesting question: What food did the men in the pillboxes have during hostilities? It’s not something I really know anything about. I assume the cooks would have tried to get hot food to them when it was safe to do so, and I assume they had some sort of rations stock-piled too, but if anyone knows the details I would be very interested to learn more. 9 Meg Parkes, who must be becoming the world’s leading expert in FEPOW art, let me look at ‘Tookie’ Poole’s scrapbook. Joseph Albert ‘Tookie’ Poole served in the 1st Middlesex, and like many other POWs asked his fellow prisoners to add a sketch to each page. Frustratingly I couldn’t identify all the artists, but found Nicholas Jaffer, Artur (or Carlos?) Basto, Alfonso Barretto, Francisco Soares, and Robert Barnes. 7 Yau Sam Lo’s (HKVDC 3 Coy) granddaughter contacted me, with the unexpected and welcome news that he is still with us, living in Canada, and now 93. He lied about his age and enlisted aged just 16. 5 Ronald Clements, a freelance writer in the UK, has sent me a request for contact with anyone who can provide information for a biography he is writing about Dominica Deidre Danielle Taylor. Deidre was interned with her mother, Elizabeth Anatol Taylor, in Stanley Camp when around 7 months old, so aged four on their release. Elizabeth was from a Russian family with the surname Borisoff. Her husband, Alfred Taylor, was with the Royal Army Medical Corp. He was interned in Shamshuipo Camp and then transferred to Osaka on the 6th draft. The family were united after the war and came back to the UK on the Empress of Australia. Ronald believes that Leo A. Borisoff, a member of the HK police force, who was also at Stanley, may well have been Elizabeth's brother. Any information about Deidre, Elizabeth, Alfred and the Borisoff family would be gratefully received. 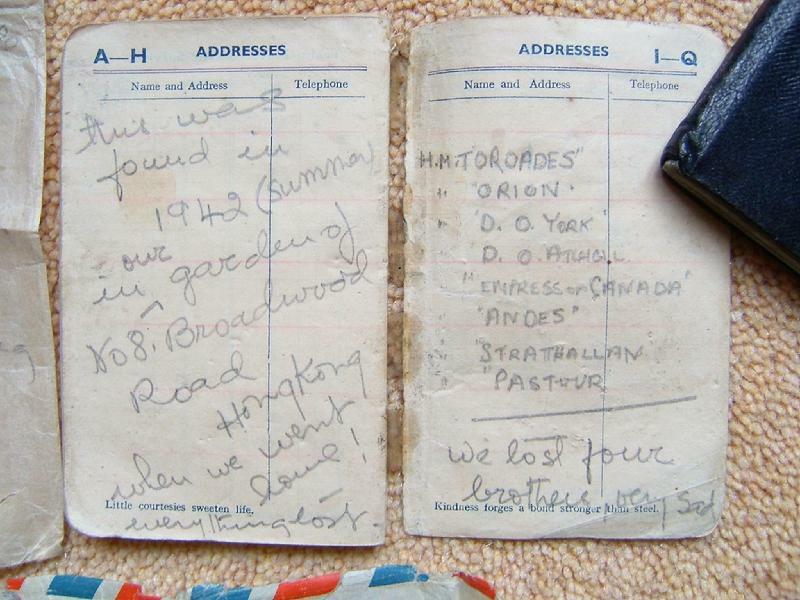 4 On the Stanley Group, Brian Edgar notes: “One of my cousins has given me the two 'lost' notes sent to my father's family in Windsor in early September 1945 just after he had left camp with my mother to try to get bread production going again”. The notes are here, and here are Brian’s families other cards and letters from the period. The Hong Kong War Diary website dates back to 2000, but took its current form in October 2003. This month is therefore, believe it or not, the fifteenth anniversary of this blog in its current form. I believe it is one of the oldest (possibly even THE oldest) continuously updated monthly blogs in the world. Readers from day one have seen 340,000 words of text (equivalent to three typical novels, and all free of charge!) and 1,800 photographs. So this extra-long edition will consist of two things: the usual monthly update, followed by a special round up of some of my favourite stories and photos from the last fifteen years. I thought I would choose one per year, just as a reminder of all that I have learned – and present it as a thank you to the now thousands of people who have kindly contributed to my knowledge of Hong Kong during the wartime years. 29 Peter Loughlin’s (HKPF, Lisbon Maru) great niece got in touch, kindly sending a photo. There were very few police on board, but by chance I had a copy of a POW post card he had sent his wife and young son, plus details of his career with the police force. I was able to give these to the family, but sadly after some research they informed me that the son (who they did not previously know about) had died at around the same time as Loughlin was lost on the vessel. 29 This evening I had a very pleasant dinner at my local with Ken Salmon (whose father Andy Salmon was on the Lisbon Maru) and Brian Finch and his wife Gillian. 28 Beautiful weather for my usual walk this morning. Among other things I photographed the May Road garages that Lube Estes had recently mentioned on the Battle of Hong Kong facebook page, the strange trench near the top of High West, and Haystack, a pre-war house on the Peak which is now the residence of the Japanese Consul. Also saw the first wild pigs of the season! 28 A very well preserved Royal Scots shoulder flash turned up in the hills today. 26 Robert Gibson kindly let me know about a new exhibition called Three Years and Eight Months: Hong Kong during the Japanese Occupation, at The Hong Kong University of Science and Technology Lee Shau Kee Library which will run from October 4, 2018 – March 31, 2019. Details here. 26 The local press today carried stories of yet another Japanese grenade turning up. The quantities of ordnance that have been found over the years always amazes people, but when I remind them that shortly before hostilities commenced in Hong Kong the British issued an extra million rounds of .303 to each infantry battalion (i.e. six million more) then the scale becomes clearer. 22 Philip Cracknel has posted a short blog on Stanley Internee Robert Grindley Southerton. 19 William Ure’s (Middlesex, Lisbon Maru) daughter got in touch, kindly sending many photos. One of them looks like it was taken in Singapore in about 1937, of the Middlesex Band (Ure is fourth from right). 18 Today I received a copy (via Brian Finch) of Andy Salmon’s personal diary and unpublished book ‘Remember My Face’ about the Lisbon Maru, co-written with Christine Henderson. 15 Bill Lake kindly sent a cutting from the Hong Kong Telegraph of 9 December 1941 reporting on donations to the bomber fund. What struck us was the familiarity of the names of the donors: Bicheno, Cautherley, Hyndman, MacGregor, Wylie – all well known to anyone who has studied Hong Kong in the period. 12 Since last month’s big typhoon I have noticed how many new views there are in Hong Kong. Great swathes of trees and brakes of bamboo have gone, and opened up new vistas. Walking back from the office today along Bowen Road I noticed how clearly visible the old sergeants’ mess at the Bowen Road Military Hospital has become, without the cover of the blown down trees. 11 Several people reported that Barbara Anslow’s book is mentioned at length in a Daily Mail article today. 11 Brian Finch kindly sent several photos of Charles Haviland (RN, Lisbon Maru). 10 And talking of mega fauna, the South China Morning Post today carried two stories about our wild pigs. In one they apparently attacked a couple of elderly people in the New Territories. In the other, three little pigs apparently went on a very orderly shopping expedition. 8 Today I received the October Java Journal (the newsletter of the Java Far East Prisoner of War Club 1942 – though for many years it has been open to every FEPOW). I was amazed and delighted to learn that Sergeant Ron ‘Royal’ Freer, of Hong Kong’s 8th Coastal Regiment RA, became 103 this month. I had no idea he was still around. He notes that he was stationed at Fort Stanley in Hong Kong, where he was in charge of the Plotting Table and Table Fire Director. He was then a POW in North Point before transferring to Shamshuipo where he stayed until liberation. 8 I took my new walk today, where instead of going Chatham Path, Barker Road, The Peak I go Chatham Road (cross Barker Road), Hospital Path, Severn Road, Plantation Road, Findlay Path, The Peak. As I neared the end of Findlay Path I saw a trio of young people gathered around a small animal. It turned out to be a dying masked civet cat; I think it had been attacked by dogs. Saddened by this I continued my walk to High West, and eventually came down via Old Peak Road. There, opposite the Ladies Recreation Club, I saw two young women standing over a large animal in a ditch. It turned out to be an adult porcupine, hit by a car. Lovely to see Hong Kong’s mega fauna, but very sad in this context. 8 Avery White’s (Middlesex, Lisbon Maru) daughter kindly shared many of her father’s photos and letters. The photos included one of Monkey Stewart, apparently proposing a toast at some pre-war celebration. The most interesting letters were written in defence of Japanese war criminal Hiroshi Morita. Most men actually felt that he was reasonable (in comparison to the majority of POW guards at Kobe), and actually helped the POWs from time to time. They felt that his sentence of twenty years was extreme, and tried to help his attorney reduce it. One 1951 letter, in good but imperfect English, was to White from Morita’s wife, thanking him for his efforts and confirming that Morita’s sentence had indeed been reduced. She asked for further help with Morita’s petition for release after serving five years. Unfortunately I don’t know the result. 6 Brian Edgar found this thesis concerning the Norwegians In Hong Kong before and after their February 1943 internment (Chapter 5). One thing that it notes: “The most relatable act of lawlessness to the Norwegians must have been the murder-looting of five Swedish nationals on Victoria peak, like them, the Swedish were third nationals, and strictly neutral in the war.” Brian added that in the book ‘Taken in Hong Kong: December 8, 1941: Memoirs of Norman Briggs World War II Prisoner of War’ by Carol Briggs Waite he found the quote: "One of the saddest instances of looting happened much later. When we were all sent to internment camp, we asked the three Swedish officers, as third party nationals, if they would like to move into the house. They were living in one room downtown in very cramped quarters. The proposal was put to them that if they lived there and kept the property out of the hands of the Chinese looters, the Company would make a settlement with them for the expenses they had in holding on to the Company property. They moved in about two weeks before we left. On April 10th they were informed by the Japanese that they would have to get out on April 15th, as the Japanese governor of Hong Kong was coming there to live. The reason for this was that it was about the only livable house left on the Peak. On the night of April 14, a gang of fifteen Chinese looters showed up, entered the house, murdered the three Swedish officers, and then went through the house and made a shambles of it. It was very sad, as we knew them quite well and knew they all had families at home in Sweden. The looters knew that it was their last night and, after the governor moved in, there would be an armed guard on the place. After the destruction, of course, the Japanese governor couldn't move in either." The location of the incident was 459 The Peak, also known as Altadena. I believe it is 27 Barker Road today. 6 I have been trying desperately to find the families of the crew of the USS Grouper, SS-214, the American submarine that sank the Lisbon Maru. None of the British POWs on board ever blamed the Americans; it was a Japanese ship carrying Japanese troops and war materials, thus a valid military target. I used to be in touch with crewman Garfield Kvalheim who passed away some years back, and today niece Sharon Tice sent me a wonderful photo of Gar and his wife Fran. Unfortunately I have not been able to contact any other of the families. 4 When I wrote the book about the Lisbon Maru I was lucky enough to find in the archives the now famous photograph of the sinking ship. It was clear, though, that originally there had been two photos. Andy Salmon’s family – perhaps twelve years ago – sent me a photocopy of the now missing second photo. It was taken perhaps thirty minutes after the first, and shows the vessel settling stern first, with the figures of POWs on the bows. Today the Salmons, via Brian Finch, kindly sent a clearer version. 2 Bill Lake noticed my mention of the special anniversary edition of the Hong Kong news of December 1942, and kindly sent me a copy of the entire newspaper! This is, I think, the first full edition of a Hong Kong News that I have seen. 2 I have had several interesting replies to my question (see last month) of whether Hong Kong’s defenders in 1941 wore long or short trousers. Ken Skelton in Canada reports Captain E. L. Hurd's, Royal Rifles of Canada, diary reporting on 16 December 1941: "During the morning of Dec. 16th the Imperial Troops raided our store house at Lye Mun and pillaged battledress. I complained to the O.C., Middlesex in our area and many were returned." Which is interesting but inconclusive as (no offense) the Middlesex were inveterate pilferers. I also looked up contemporary photos such as the one of Royal Scots captured at the Shing Mun Redoubt, and they are all wearing long trousers, and of the Canadians landing in November and marching to Shamshuipo all apparently wearing shorts. And then Barbara Anslow kindly let me know that: “my diary of 18.12.41 records that Sid Hale of Royal Scots who had been in Military Hospital with wounds, called to see me on his way to rejoin his unit 'wearing khaki shorts and tin helmet’.” So perhaps men wore a variety. 1 Brian Finch has reported something very unusual: the record of the funeral service of William Fraser, Royal Scots, in Kobe, 1943. As death in POW Camps was sadly on an industrial scale, I had previously assumed funeral services would have been almost robotic. Not so, it appears. This service, conducted by an American Naval Officer, Commander Harrison, was personal and sincere. 1 Another one from Brian Edgar. While Augusta Wexham and her husband (Robert Wexham, RN, who perished on the Lisbon Maru) appear in the records, there is no mention anywhere of a son, and of course it is nonsensical to suggest that a child was on the Lisbon Maru. 1 Brian Finch kindly sent me several photographs of Martin Weedon, commander of B Company of the Middlesex. One of them (illustrated) was a particularly fine portrait. 1 At the end of last month, Brian Edgar found an article from the Coventry Evening Telegraph, May 27th 2002. 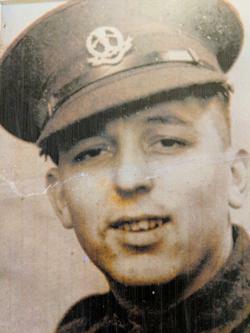 It read: “Schools Honour the Memory of PoW Campaigner. A CONCERT has helped a fund in memory of a wartime prisoner of the Japanese who died from a rare disease. A show by Catholic schools in Coventry raised pounds 975 for the Amyloidosis Research Fund in memory of Florence O'Grady, of Daintree Croft, Styvechale, who survived a Japanese PoW camp and went on to win compensation for inmates. She died, aged 63, last May, from degenerative disease amyloidosis. The concert was held at St Mary's RC School, in Lansdowne Street, Hillfields, where she was a teacher for 30 years. The proceeds have taken the total of the research fund to pounds 5,700, which has delighted her husband, Gerard. He said: ‘I'm very very touched by the way people have responded and it's most generous. It shows the esteem in which she was held because she really was an exceptional person.’ Mrs O'Grady was just three years old when her family was captured by Japanese troops who marched into Hong Kong in 1941. She was held in Stanley Camp on the island for almost four years. The tireless campaigner won pounds 10,000 compensation from the government last year as part of a payout to all former prisoners and their widows to recognise their suffering. Mr O'Grady, aged 61, said the Royal Free Hospital, in Hampstead, where the amyloidosis research fund is based, is the only place in the country which is researching the disease. He is campaigning for greater awareness of the rare condition which kills up to 300 people a year. He said: ‘They're now trying out drugs on people which will hopefully control the condition, which they're very positive about. I feel the more awareness is raised, the more things can be done in the long run.’ “ Researchers in the Stanley group believe she was Florence Roberta James, born 1 Dec 1937. Probably Florence’s mother was married to Private James Ivor James of the Middlesex who died on the Lisbon Maru. His POW card has Mrs James 368 The Peak HK. Barbara Anslow mentions a little girl Flossie James a couple of times in her recently published diary, she was a fairy in Peter Pan in August 1944 and was confirmed in May 1945. Oddly, James’s CWGC entry mentions no wife. 1 The HKVCA facebook page showed a very interesting set of photographs entitled ‘Officers of the British Forces and the Canadian Forces visits the Sai Wan War Cemetery in Chai Wan, Hong Kong, 1947’. I hadn’t seen these before. In fact I thing these pre-date the earliest Sai Wan photos I have in my archives, showing the top section of the cemetery bare of graves. 1 After my notes about last month’s typhoon and the number of trees lost, I see that number has now been upgraded to an unbelievable 46,000 (upgraded yet again at the end of the month to 60,000). The South China Morning Post reports that the old runway at Kai Tak is now being used to store them. The same edition also noted the coming retirement of Tony Chow Shek-kin, who has headed EOD in Hong Kong for many years and certainly deserves a long and happy retirement. It’s very easy when considering history to forget that the objects of our interest were real people. Mr Trinder was lost in the sinking of the Lisbon Maru, and I was immediately struck by the obvious character of the man in this outstanding portrait. 2004 … and some of them were children. I think the impact here is the combination of the exact place and time (North Point Camp, 19 December 1941) and the resilience of children. I used to know several kids who had been taken to North Point on that day, and although Julia is laughing here, what they saw – especially when wounded Canadians were brought in – stayed with them forever. Raquel and her two daughters were in Room 15/15 in Stanley with the Eagers and Worrals. Between the wars, Hong Kong and Shanghai were considered prime postings. A humble soldier could do very nicely in cities which (though it’s hard to believe now) were then very poor. This photo epitomises the high life, though all three men would see the lows of the Lisbon Maru with only Poulter surviving. 2006 … and women served too. 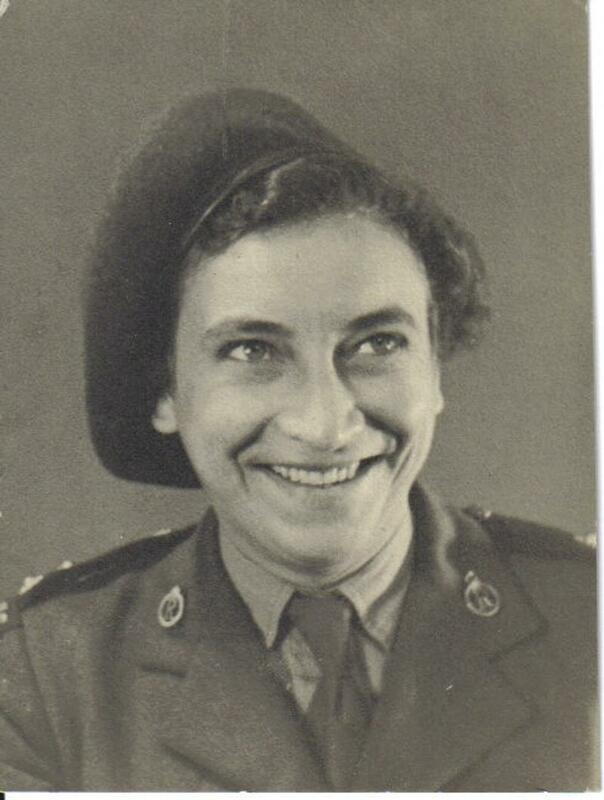 Joan Whitely was one of many women serving in Hong Kong. She was interned in Stanley, but left there soon after the Japanese surrender to work at the Central British School (now KGV) hospital. Middlesex soldier Percy Chittenden’s diary was found on Leighton Hill just after the fighting, and was kindly sent to him by the Reed family post--war. Sadly, that family lost four sons in the HKVDC during the war. Gunner Francis Oswald Reed, Private Edgar Vincent and Private Arthur Augustus Reed were all killed in the December fighting, and Private Stephen Arnold Reed died of wounds early in the New Year. “Ok, Tony, here goes!! Kind regards, George”. This photograph – taken during Barbara Anslow’s visit - is (from left to right) Geoffrey Emerson, my good friend the late Toby Brown, Barbara Anslow, Barbara's daughter (I believe), my wife, and a bearded George Cautherley (who was born in Stanley Internment Camp). Barbara was showing us round and explaining the story behind each headstone. Later we retired to Stanley for lunch. I have another treasured photo of Barbara and I giggling like teenagers, but I have no recollection why. 2009 … and to stay in touch with them. Now, to most people that would mean very little. But to me it means Elizabeth Ride’s (daughter of Brigadier Ride, the founder of BAAG) annual visit to Hong Kong. We always met up, and I learned great deal. And our kids loved her visits too because their own grandmother was too poorly to travel by then, and Elizabeth would bring them little gifts; they called her ‘stunt nana’. 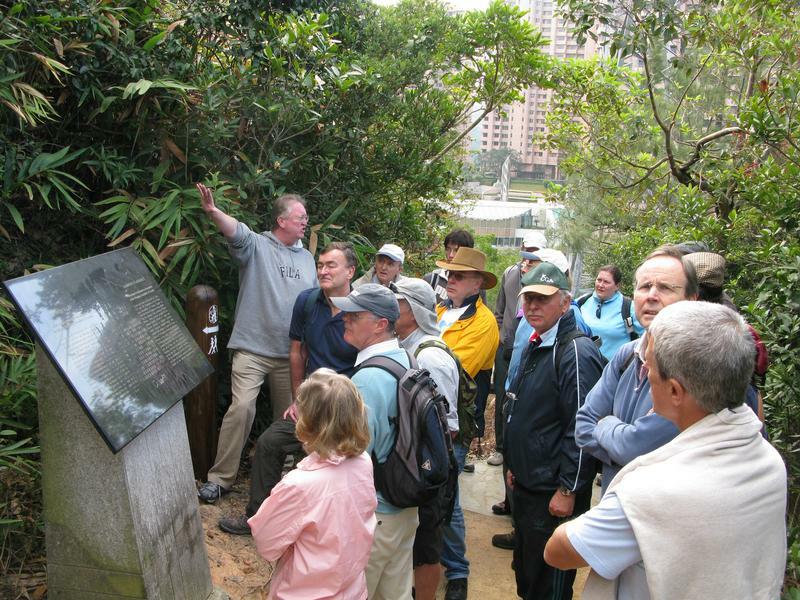 This is one of Robert Gibson’s excellent photos of our Hong Kong Club walks. I started taking the Club for historical walks many years ago, when no one else seemed much interested. Now at least one of those who accompanied me then conducts walks of his own, and many more people – local and foreign – are passionately interested. The research by the younger generation today exceeds the little I was able to do then, and no one is happier to see this than me. 2011 … and finds, one way or another, keep turning up. It seems that every month people find things in Hong Kong’s hills and are kind enough to let me know. I could have filled each one of these years with photos of shells, grenades, guns, magazines, bombs and so forth – but I chose not to as these things are dangerous and I don’t want to encourage people to search for them. But sometimes other, safer (perhaps? I’m not sure in this context!) items turn up too. 2012 They had skills that later generations lost. Captain John Hudson, Middlesex, family sent me this map (among many). I believe it was drawn by Lance Corp Ken Sawyer, Royal Army Veterinary Corps. Judging from the scrapbooks kept in POW Camp, everyone then could sketch and write poems that put our modern generations to shame. 2013 Not every project pans out. Aaargh! I spent years (literally) writing Walking The War, a book of illustrated war walks – and drawing the maps by hand - and for one reason or another it never got published. What a shame. Maybe one day. These were the ten carefully researched walks I put together over the years for the Hong Kong Club. Hong Kong, perhaps more than any other city, has changed dramatically since 1941. Sometimes so much so that it is hard to grasp that the events we read about really happened in our streets and hills. This merging of ‘then and now’ helps fix those events in our times. 2015 … and reverberates to this day. Geoffrey Emerson’s photo is worth a thousand words. All these people started their lives in Stanley Internment camp and revisited Hong Kong in 2015 for the reunion which Geoffrey organised. Ben Dalgleish’s grandfather was Ip Kwong Lau, a member of the Hong Kong Chinese Regiment. He escaped from wartime Hong Kong, joined up with BAAG, then became a Chindit. Uniquely (to the best of my knowledge) he later became the only member of Hong Kong’s wartime garrison to join the SAS. (Winnipeg Grenadier John McCoy, an American, joined the Rangers post war and was killed in Vietnam. He may well have been the only other Hong Kong veteran to have joined Special Forces). So it’s not surprising that Ben joined Watershed for their uniformed re-enactment of 1941 marking the seventy-fifth anniversary in December 2016. But the fact is that most of the emails I receive are also from current generations trying to understand the experiences of their ancestors. 2017 … and we’re not finished yet. So that’s the most recent book done and dusted. But there’s lots more to do. I have half a dozen potential articles for the Royal Asiatic Society at least half finished, and two or three more books I’d like to complete before I too leave this mortal coil. But of course I’ll report back on all of that in 2033 when Hong Kong War Diary celebrates its thirtieth anniversary! Egad, what a typhoon. The winds of Sunday 16 September were stronger than anything I have previously experienced. It was the most intense typhoon yet recorded in Hong Kong’s history, and – for those of you lucky enough not to be here – to be honest the most frightening. The authorities tell us we lost 17,000 trees, but I think those are just the ones on the built up areas; those lost in the hills are uncountable. And even our heritage suffered: the up till now perfectly preserved observation post at Cape Collinson was wrecked by the winds; thus we lose 2nd battery’s history. 30 For the first time in two weeks I was able to do my full Sunday hill walk of Hornsey Road, May Road, Chatham Path, Barker Road, round the back of the Peak, up and down High West, back up to Mountain Lodge, then down Mount Austin Road, Old Peak Road, and home. The smaller paths still had a few trees I had to walk under or over, but it’s mostly clear. What’s also clear is the amount of broken limbs on the surviving trees; now they have all turned brown, and on the east facing slopes of the hills there’s as much brown as green. 30 Anne Ozorio posted a very interesting link to a blog by Ben Thompson, who I believe is Private Ben Thompson, RASC. It describes Shamshuipo and his transportation to Japan on the third draft. 29 Andrew Thomson’s (Royal Scots, Lisbon Maru) family kindly sent me photos of him with two unidentified companions. I wonder if anyone can identify either of them? 29 I was a little shocked today looking at Amazon, to see copies of The Sinking of the Lisbon Maru advertised at GBP 851.99 and even GBP 1,589.33! I must ask HKUP to ship Amazon another edition at normal prices. 28 Here’s an interesting question: Which member of the HKVDC had the serial 4038? Whoever it is, something has been found in the hills that might once have belonged to him. 28 I had an enquiry today about British uniforms of December 1941. Would the men have worn short or long trousers? As the December weather tends to be cool I had always assumed the latter, but that is just a supposition. Does anyone have any concrete evidence? 27 Brian Edgar has found yet another interesting newspaper report! This one concerns Canadian civilian nurse Mary Fairburn, who was initially evacuated from Hong Kong in 1940 but returned before hostilities. She was the wife of Thomas Fairburn, RNR. It was in November 2011 that I had a question from a journalist asking who nurse ‘G C Fairburn’ was. I replied: “I think she must have been Mary Constance Fairburn, born 06 - May - 1900. She was at the University Relief Hospital, and was a Canadian. She was interned at Stanley Civilian Internment Camp after the fall of Hong Kong, and was repatriated to Canada 23 - Sept - 1943.” Until now I had no idea what had resulted from this conversation. 25 Brian Edgar has found a newspaper report on the passing away of Audrey J. Casey (née Barton. She was one of the big Barton clan in Stanley). 21 This is a long shot, but since my submariner friend Garfield Kvalheim passed away I have lost contact with all families of the crew of SS-214 USS Grouper – the submarine which sank the Lisbon Maru. Does anyone have any contacts with the families of any of the Grouper’s wartime crew? 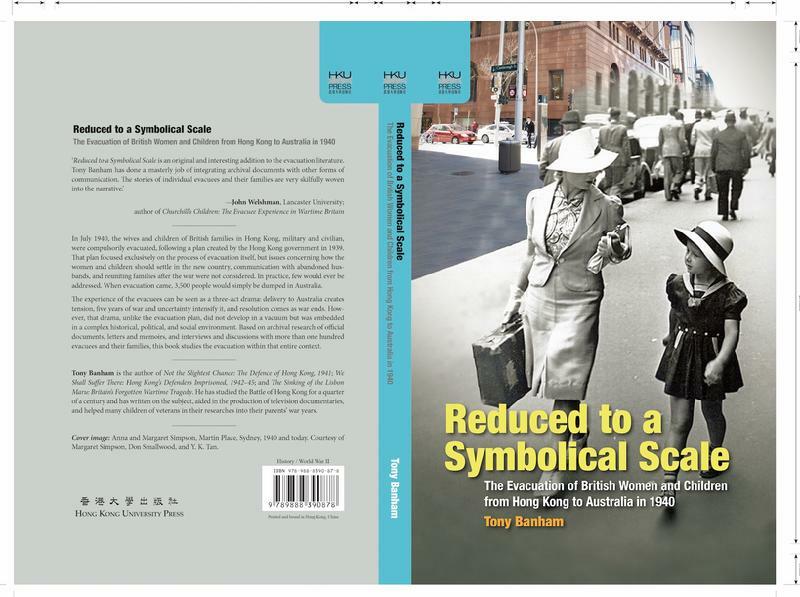 20 I learned today that my latest book, Reduced to a Symbolical Scale, has been reviewed in the Journal of the Royal Asiatic Society Hong Kong, Volume 58 (2018). I found it a very balanced and fair review, and loved the comment: “For the data, we have Banham”! The conclusion noted: “Banham’s work over many years on exactly this kind of meticulous enumeration of copious personal detail is always impressive. Unfortunately, the current management of Hong Kong University Press has allowed this work to languish under an odd title, a clumsy cover design and the kind of pricing that will prevent most people interested in this subject from being moved to buy it.” But I have to come clean; the price is out of my hands, but the title and the photo on the book’s cover were entirely my idea. While personally I actually quite like the cover, I have to accept that the title was more than a little self-indulgent. A previous reviewer had made a similar criticism. My thinking, of course, was that Winston Churchill’s famous comment: “This is all wrong. If Japan goes to war with us there is not the slightest chance of holding Hong Kong or relieving it. It is most unwise to increase the loss we shall suffer there. Instead of increasing the garrison it ought to be reduced to a symbolical scale. Any trouble arising there must be dealt with at the Peace Conference after the war. We must avoid frittering away our resources on untenable positions. Japan will think long before declaring war on the British Empire, and whether there are two or six battalions at Hong Kong will make no difference to her choice. I wish we had fewer troops there, but to move any would be noticeable and dangerous”, would give me the titles for all five of the books in this series. Alas, I screwed up on the Lisbon Maru book (which should of course have been entitled Frittering Away). Noticeable and Dangerous – the story of BAAG, the Hong Kong column of the Chindits, and all the other late war contributions of those who escaped Hong Kong’s garrison – is not yet complete. 19 Captain John Reid’s (RCAMC) son got in touch, with the welcome news that he is writing a book about his father. Uniquely of all the Canadian officers, Reid went to Japan. 17 Reginald Spencer and Geoffrey Spencer’s (both RE, Lisbon Maru) family got in touch. 16 George Mose’s (RA, Lisbon Maru) great grandson got in touch. 16 Typhoon day. We had noticed this one on the satellite data as far back as Tuesday when it was forming over Guam. Even then it looked like it might make a direct hit on Hong Kong as a Super Typhoon. At the height of the winds of Sunday afternoon we barricaded our French windows with our heavy teak dining table, locked ourselves in the kitchen (our Safe Room, sheltered from all directions), and listened to trees being torn down all around the house. When you see the destruction and rain fall on a scale like this, it’s amazing that so many relics from 1941 still get found up in the hills. And I suspect some of the old tree roots now brought to the surface may bear interesting bits and pieces. 15 Steve Denton and I have been straining our brains over Private William Mackay, 2927763, Royal Scots. Different documents both muddle him up with someone of a similar name, and show him as both being on the third draft and surviving Osaka #3B, and being on the Lisbon Maru and losing his life. 7 The HKVCA have published the latest edition of their newspaper. 6 Cecil Tubb’s (RA, Lisbon Maru) great niece got in touch. 6 James Melvin’s (Royal Scots, Lisbon Maru) son got in touch. 4 Barbara Anslow’s book Tin Hats And Rice was waiting for me today when I returned from a business trip to San Francisco. Although Barbara had been kind enough to give me an indexed photocopy of her diary many years ago, I had never read it from end to end until today. What an experience! I would thoroughly recommend it to anyone with an interest in Hong Kong during the period. 3 Martin Heyes reports taking the family of Bill McHardy (Hong Kong Police) for a tour of Hong Kong. He notes: “and what a fascinating career he appears to have enjoyed! He was in the Water (Marine) Police and also served in the New Territories. (I believe that pre-WW2, Water Police & NT were one and the same). In 1938 Bill was awarded the CPM for gallantry, together with a small group of other policemen including one Chinese coxswain. Despite spending an afternoon in the Public Records Office with the very efficient and helpful staff there, I have not been able to ascertain the details of the incident which led to this award. All I have been able to glean is that is was an incident on the border.” He also kindly sent a number of photos. 2 Chris Harley gave me the good news that Jessie McDonald Holland has now been accepted into the Civilian War Dead list maintained by the Commonwealth War Graves Commission. Unfortunately the Auxiliary Nursing Service does not warrant a standard CWGC headstone, so perhaps we can raise one locally. (See January). 2 George Boote kindly sent me a scan of a Lisbon Maru article in Britain At War magazine. 2 Mike Butterworth kindly sent me a scan of the Sunday Post article about the Lisbon Maru featuring Iain Gow and his father. (Note that a number of versions of this editorial give the caption: “Chinese fishermen watch as the Lisbon Mari lists and sinks beneath the sea” to a photo that clearly shows Imperial Japanese naval personnel.) Iain himself sent me a scan from the print version too. 1 We are now well and truly in contact with the family of the renowned Henry William Moncrief ‘Monkey’ Stewart, Commanding Officer of the first battalion the Middlesex regiment. They note: “We have located two of HWMS’s photo albums which have pictures and a lot of written detail against these and go from around 1908 on wards covering school, Sandhust, First War postings, second war postings, all the way through to just a few of Hong Kong... You can see from one of these that HWMS was on leave in the UK up till May 1939 and we can’t find anything after that. So one has to assume that like the First war Medals any information after this was lost in Hong Kong.” Most excitingly, they sent some excellent photos of Monkey, including the lead photo for this month. 1 TK noted that he was quite delighted: “to come across several good photos of Kai Yuen ([which] means Perpetual Garden in Chinese) lately. I am sure you have seen the captioned letter before. Lt General Tadayoshi Sano (commander of the 38 Division, IJA) set up his divisional headquarters in Kai Yuen after landing on the morning of 20-12-41. He allowed Stewart to use a sheet of paper bearing the Chinese characters of Kai Yuen to inform Wallis to surrender in Stanley and it was dated 25-12-1941. You can see this letter in page 114 of Lindsay's book: The Lasting Honour. Benjamin Proulx (Canadian served in HKRNVR) vividly described Kai Yuen in his book (Underground From Hong Kong - page 175) after he emerged from the sewer pipe and the fountain. The captioned photos clearly show the fountain and the surrounding scenes.” Very useful! I have known of that photo for 30 years, but never before realized the significance of the Chinese characters. Obviously I immediately sent a copy to Stewart’s family. 1 Wayne Carew is trying to find the family of his mother’s cousin Veronica Thirlwell (Willey) who passed away in 2008 in Sao Paulo Brazil. He has sent numerous messages to Natalia Ramos who he believes might be her granddaughter but has had no reply (possibly because of the language barrier as they only speak Portuguese). 1 The granddaughter of 1940 Hong Kong evacuee Olive Tyner (who was married to William Tyner, RAMC, who died as a POW in Japan less than a week before the end of the war) contacted me to ask if anyone had a copy of the radio 3AR Hong Kong broadcast which I mentioned in Reduced to a Symbolical Scale. I have never heard of one, myself. 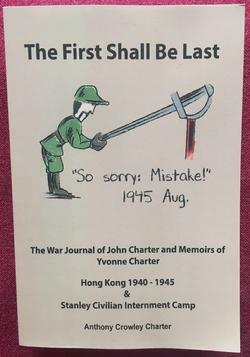 1 On the Battle of Hong Kong facebook page, Tommy Wong posted a copy of the HK News edition ‘celebrating’ the first anniversary of the fall of Hong Kong. 1 Colin Standish kindly sent me copies of more Japanese propaganda artwork. 1 Burke Penny (author of the useful book Beyond The Call) notes that he is: “gradually starting to work on finding more information about the activities of the RCCS at East Brigade HQ.” He has written a blog post on the topic, and kindly also sent me four photos that his brother had taken on site. A trip to Australia and New Zealand (to be confirmed). Meanwhile, the director is storyboarding the entire documentary, starting the preparation of the film reenactment part (script, art direction, creating the ship model, studying costume props, casting, and so on), hopefully finishing this part before the first half of 2019. In the second half they will focus on editing, music, colour matching, dubbing etc. If all goes well it will premiere in London in late October 2020, but let’s see. 30 I heard today that Janis Hollis (daughter of Cuthbert Gowland, HKVDC) had passed away on the fifteenth. She gave me a great deal of help in writing Reduced to a Symbolical Scale, and the hard times she experienced during the war often made me realize how lucky I (and many of my generation) have been in comparison. I dug out a photo that Janis had sent me of the family. Her father is at the back, and she is far right at front. 30 My copy of Barbara Anslow’s book was waiting for me when I returned from San Francisco. I’ve actually had an indexed copy of her diary since she sent one to me at least ten years ago, but it’s still very nice to see it in book form. I believe David Bellis of Gwulo deserves a lot of the credit for facilitating its publication. 27 For many years I have wanted to track down the family of Lieutenant Colonel ‘Monkey’ Stewart of the Middlesex, who not only commanded (arguably) the most professional force in Hong Kong’s wartime garrison, but also masterminded the epic defence of Wanchai, but was then the senior officer on the Lisbon Maru – passing away just days after reaching Japan. Today – thanks to Brian Finch’s sterling work – his granddaughter sent me a file full of photos and information. There’s a lot to process, but one image was of his Court medals (from both wars). The family also have the originals of his WWII medals, but not the WWI ones. Most likely these were either lost in Hong Kong or went down on the Lisbon Maru, but I thought I should check and see if anyone has ever heard anything about them? 26 Thomas nelson’s (RA, Lisbon Maru) family got in touch. 25 Mark Clayton posted a photo of POWs at Ohashi (Sendai #4 Branch Camp) at liberation. It looks to me to be George MacDonnel top row fourth from left, and it’s Richard Keays is in the second row from the front, sitting third from the right. 25 Having fielded lots of questions about Hong Kong POW Index Cards I thought it might be useful to post examples of four of the most common, relating to the first three drafts. 24 Today I met with Joseph Gregory S.Y. YU, a D.Phil Student at the University of Oxford who is studying non-governmental museums, with a particular interest in St Stephen’s College’s Heritage Gallery. His alma mater is Queen’s College, a number of whose teachers served during the war or were interned in Stanley. I’ll help research them properly when I have a moment. 24 Ron Taylor (HK) was kind enough to let me know that Alexander ‘Shura’ Shivarg has passed away. He was a White Russian from Harbin, who fought in the HKVDC and became a POW in BMH Borrett Road and North Point. After the war, he was given a British Passport and settled in the UK where he opened a popular northern Chinese restaurant in Knightsbridge, the Good Earth. He was married to Joan Wyndham, the famous author, and lived in Chelsea, where they were both members of the Chelsea Arts Club. 22 I received this query from a fellow researcher: “I am looking for information on a member of the British Armed Forces by the surname of Wilson who either died in HK, was MIA, or maybe was taken POW and died elsewhere. The only other information I have is that he had an Irish wife from Kilmihil County Clare and a small daughter. They were in Australia during the war, presumably evacuated.” I can’t find anyone in my evacuation records who fits this. Can anyone help? 22 Barbara Anslow’s book is available! Tin Hats and Rice can be purchased here. 20 Very welcome news today from Chris Harley, that the Commonwealth War Graves Commission is seriously considering Mrs Jessie Holland’s case (see January). I have provided two more documents that they requested. As she was a serving member of the ANS I am hopeful that her current unnamed headstone in the Colonial Cemetery (now called the Hong Kong Cemetery) will be replaced with a standard CWGC stone. 20 Frank Charles Hinge’s (RN, Lisbon Maru) grandson got in touch. 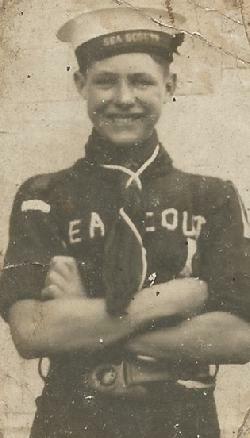 19 Brian Finch kindly sent a photo of Harry Mace (RA, Lisbon Maru) as a youngster wearing Sea Scouts uniform (illustrated). 19 Wilfred Drew’s (RA, Lisbon Maru) nephew got in touch, kindly sending photos. 18 Ron Taylor (UK) kindly sent me a photo of George William Hutchinson (RN, Lisbon Maru). 17 Ming let me know today that Fang Li will shortly be advertising in Japan for anyone with knowledge of the Japanese side of the Lisbon Maru story, and in the US for anyone with connections with the USS Grouper. I emailed my old contacts (family of Garfield Kvalheim who helped me write the book), but have still not found his children. 16 Another Lisbon Maru story appeared in the press today. 16 Hong Kong evacuee Kathleen Crawford (Nee Matheson) kindly wrote to tell me that she had enjoyed reading Reduced to a Symbolical Scale. 15 The gentleman who thought he had the medal group to Major Victor Cecil Branson (see last month) has now concluded that in fact the recipient was Lieutenant Colonel Reginald David Walker OBE, MC, ED. He is seeking his HKVDC records, but I will need to take advice about that. 10 Another typically top quality blog from Philip Cracknell, this time featuring Douglas Baird of the Royal Scots (and also Lisbon Maru). 10 Thomas Baker’s (Middlesex, Lisbon Maru) got in touch via Ronnie Taylor in the UK. 10 Arthur Basto’s (HKVDC) son-in-law got in touch. 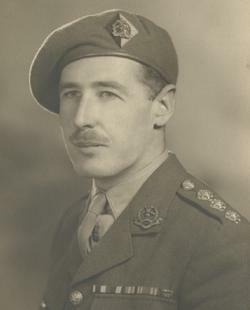 9 Colin Standish let me know that he had finally – after searching for six months – found the transcript of the Valour and the Horror’s interview with his grandfather CQMS Colin Standish, DCM, Royal Rifles of Canada. He was kind enough to send me a copy. Regular readers would know that I am not a fan of ‘historians’ who try to sell through making their works as controversial as possible – and the V and the H fall firmly into that category. However, the interview was a fascinating read. 8 I was contacted by the Air Historical Branch and sent them my annotated list of RAF personnel in Hong Kong during the war. 6 With all the focus on the Lisbon Maru at the moment it’s important to also remember the Volunteers, the Indian army, and the Canadians (none of whom were on this draft). For the latter, I hear that as of this writing there are just eleven C Force Veterans still with us. One Brigade HQ, Horace Gerard, one Winnipeg Grenadier, George Peterson, and nine Royal Rifles of Canada: Phil Doddridge, George MacDonnel, Fred Cooper, William MacWhirter, Ralph MacLean, Doug Rees, and three others. 6 Philip Cracknell kindly sent me a photo (via the family) of Captain Kenneth Allanson who was on the Lisbon Maru. He has written another of his excellent blogs about him. 5 The Lisbon Maru documentary has soaked up most of my spare time this month. The two open searches are for anyone on the Japanese side who might have family connections with those in the Imperial Japanese Navy who witnessed the end of the vessel, and for any family members of the USS Grouper’s (SS214) crew. When I wrote The Sinking of the Lisbon Maru I was very lucky in finding Garfield Kvalheim from that boat (and his lovely wife Fran) but I never contacted any other crew members. Does anyone else have any knowledge of them? 5 I had an interesting discussion with Philip Cracknell about Hong Kong’s batteries. The three medium batteries in HK 3rd, 4th and 25th each had a troop of four 6-inch in two sections, but one battery would normally have two troops of four guns each. Why were Hong Kong’s batteries under strength? And what exactly is the definition of a ‘heavy’ battery? 3 This is a little unusual. It appears to be a British 9.2 inch shell accidentally moved from one part of Hong Kong to another as a ‘natural’ part of land reclamation! 2 Author and historian Dr Bernice Archer contacted me to see if I would be interested in speaking at the 2020 RFHG Conference. I’m certainly interested (I spoke at the 2008 and 2010 conferences – though I can’t see the latter mentioned on their website), but it’s a little far out for me to be certain I’m free from other commitments at that time. This summer (and this is why the July update is a little late) I have spent six solid weeks traveling, first on business and then holiday – twenty-two airports later I’m home. At the end of the holiday we spent a few days on Malta. It’s a fascinating comparison. 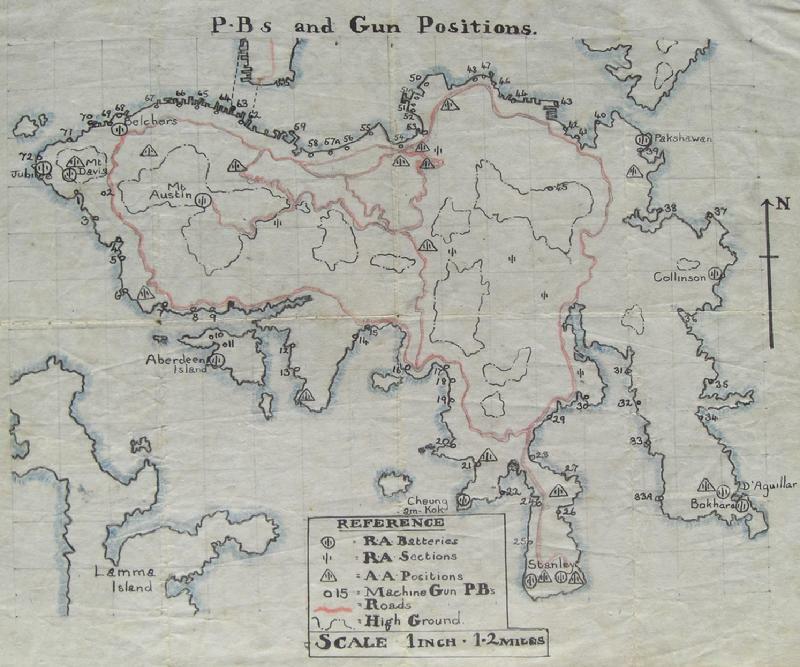 Both Hong Kong and Malta are small, hot, islands (the former more dry and Mediterranean in style, compared to Hong Kong’s verdant humidity), but both saw war in very different ways. But Malta is preserved in time; those buildings totally destroyed have been replaced with modern equivalents but all old wars bear scars. Hong Kong maintains physical scars too – but in contrast they are only visible for those who know exactly where to look. 31 Alan Bayram’s (RN, Lisbon Maru) son got in touch, kindly sending a number of photos. Bayram was one of the ex-POWs who volunteered to stay behind in Japan after liberation to assist the American forces in administering the evacuation of the others. They all stayed at the New Osaka Hotel. I had spoken to one other of this group (Charles Jordan, RA) before, but these photos included a letter of thanks from the US Forces, and a full list of the volunteers – neither of which I had previously seen. 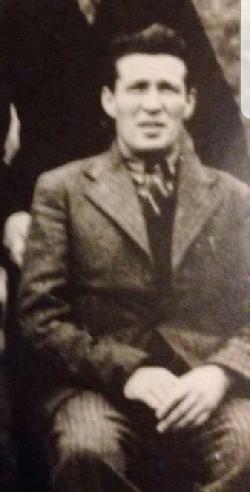 31 Keith Grant (see April) kindly sent me a photo of Stanley internees Archie McAlpine, Elizabeth McAlpine. Annie Thomson (nee Organ) and Archie Thomson. 30 Harold Bater’s (RN, Lisbon Maru) great grandson got in touch. 30 Harry Howard’s (Winnipeg Grenadiers) great granddaughter got in touch. 30 Barbara Anslow let me know that her book (a published version of her war time diary) is now ready for pre-order here. 25 Sandy Wynd points out that Major Shields’ grave in Stanley Cemetery (he died in Stanley camp aged 62) bears the incorrect age of 45. I think this must be one of those cases of the number slowly morphing over the years of being repainted. 24 Philip Cracknell has posted a new blog about the pre-war building 23 Coombe Road. 24 Today, my birthday, I saw a very kind card from Luba Estes on the battle of Hong Kong facebook page! 24 Martin Heyes notes that he gave a tour to Margaret Whyte (the niece of William Stirton McHardy, who was a HK Police Sergeant in charge of Cheung Chau at the time of the Japanese invasion of HK). Bill was interned in Stanley and Margaret has fond memories of her favourite uncle and his wife, Mona. 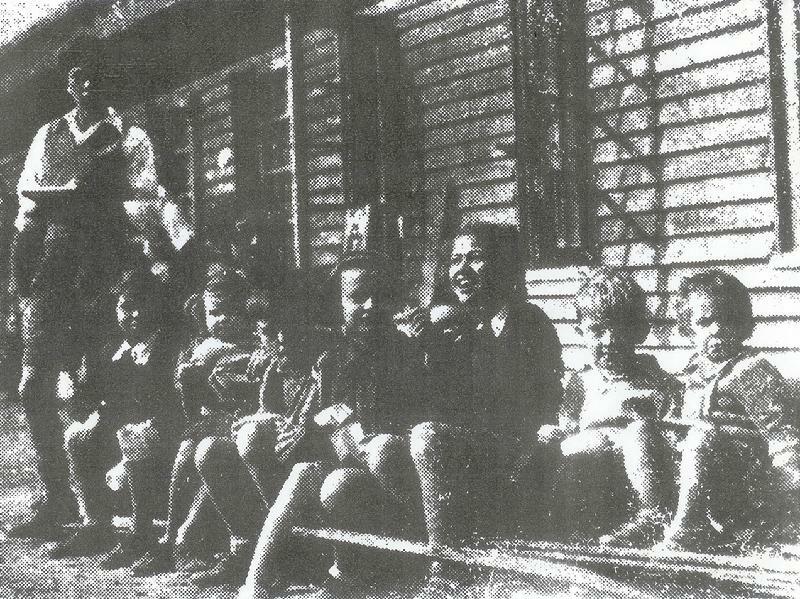 Mona spent the war in Australia, having been evacuated in 1940. Martin also passed me a soft copy of the Hong Kong Government’s official Stanley list. 23 Robin Fabel had earlier contacted me asking for suggestions of where to lodge his father's (Fred Fabel, Royal Army Educational Corps) POW Hong Kong and Japan papers. I suggested they might well find a home in his regimental museum. He has now let me know that there is no RAEC museum as such, but the Museum of the Adjutant General's Corps has welcomed them. 21 Steve Denton was kind enough to show me that Major John Vickers, Royal Corps of Signals (who is in my lists with a question mark) was not actually in the Hong Kong garrison. I suspect he died in Taiwan and was simply reinterred here. 20 Brian Finch has been doing a great job, constantly sending me questionnaires and photos resulting from the Lisbon Maru advertisements in the Telegraph, Times, Spectator, and other publications. I’m not even trying to count them at the moment, but will do so when the flow slows down a bit. My feeling is that we have amassed at least 160 photos now. 19 Gonville Jones’s (RN, Lisbon Maru) niece got in touch. 19 The HKVCA have a very nice tradition of posting ‘individual reports’ on facebook of members of C Force. Today they included a very nice colourised photo of Ferdinand Poitras (illustrated). 18 Chris Bilham, hearing of my studies of Hong Kong’s awards and decorations, notes that he has four medal groups to sailors who took part in the defence of Hong Kong: E.T.A. Davis, CERA HMS Tern (and Lisbon Maru survivor), A.J. Selman, A/P.O. HMS Tamar, KIA 25.12.1941, A.L. Downey, AB MTB 09 who escaped with Chan Chak, and F.W. Mitchell, Lt Cdr, HMS Robin. He also formerly had the medals of Lieutenant Scott-Lindsley (but sold them before discovering that his diary and sketches are in the RN Museum) and for the liberation has the DSO of V. McLaughlin RN, Captain of HMS Swiftsure. 17 Fred Cowley’s (RA, Lisbon Maru) niece got in touch. 15 Martin Heyes notes that he has recently helped Audun Urke write a paper on Norwegian sailors during the battle for HK and the subsequent Occupation. 15 Edmund Hutton’s (RN, Lisbon Maru) granddaughter got in touch, kindly sending a photo. 15 The Telegraph ran a Lisbon Maru story today. 15 Elizabeth Ride kindly sent me an old photo of the Umbrella Seat at the corner of Mount Austin Road on the Peak. While not strictly World War Two related, the structure obviously predates the war and I pass it every Sunday when I walk to High West and the Peak. 14 Today the BBC released their new Lisbon Maru story, which included a photo of one of Gong Li’s scans of the ship where it currently lies. 14 Robert Chilcraft’s (RN, Lisbon Maru) family got in touch. 14 Jack Green’s (RN, Lisbon Maru) daughter in law got in touch, kindly sending letters and photos. 13 The BBC contacted me asking if there were any other known survivors from the Lisbon Maru still around aside from Dennis Morley (Royal Scots). I mentioned William Beningfield (Middlesex), who is the only other one I am currently aware of. 11 A researcher has found a group of unattributed miniature medals with a Territorial efficiency decoration bearing a clasp for Hong Kong, and an M.B.E. & M.C. plus campaign medals including a Pacific Star and a G.S.M. bearing a clasp for South East Asia 1945-46. He is still researching, but believes this may have been the group to Major Victor Cecil Branson, HKVDC. 8 Here is the link to the extract from Mary Monro's Stranger In My Heart, published in the Post Magazine today. 7 James Burns’ (Royal Scots) and Tommy Burns’ (Royal Scots, Lisbon Maru) great nephew got in touch, kindly sending photos and newspaper reports. 7 The Daily Express notes that Sidney Charles medals are for sale (showing a photograph of him which was given to me by his family, and presumably simply lifted from my website). 6 Lieutenant Colonel Fred Field’s (RA) grandsons got in touch, kindly sending his account of the battle and a number of images, including a show program for ‘Nuts & Mayhem’. I have been collecting as many of these camp entertainment programs as I can, but this one was new to me. I believe another photo is unique: it shows a row of RA officers taken at the HKSRA Centenary celebrations September 1941. From left to right: Ian McGregor ADC, Mrs Macleod, Major General Maltby, Jack Yale, Brigadier Macleod, Webb Temple, and standing, Field, Tony Atkinson and Geoff Proes. Yale and Temple would be killed at Wong Nai Chung Gap in December. 4 Steve Denton kindly sent me a set of Canadian War crime affidavits, many referring to the executions of local Chinese civilians witnessed from the camps. 1 I heard from Patricia O’Sullivan who has been looking at the CO 1070 card collection at TNA. She found a card for Henry Dixon, an Irish-Portuguese, born in 1865 the son of the first Inspector of the naval Dockyard police. However, it states that he was out of camp and ‘Under camp diet and doing camp duties every day’. I’ve never seen that before. Anyone know what it means? Obviously the big news of the month is Laurel Films and their serious initiative to film a comprehensive Lisbon Maru documentary. For the last year I’ve been hearing about their work (and all positive), but this month I took a day off as they were in Hong Kong and spent it with them. They seem to have the hoped for combination of finance, competence, and passion. After all these years I think it might actually happen! I have now reached out to all the Lisbon Maru families I have spoken to over the years (something over 200) to see what we can pull together. One thing the team would love to do is trace the family of the ship’s master, Kyoda Shigeru. I have tried all the avenues I can think of both here and in Japan but without success. Note: Extensive travel for the next three months may result in site updates for August to October being a few days late. Of note, the October edition will celebrate 15 years of this blog being published in this format, which will make this site one of the oldest continuously published monthly blogs in the world. 30 A number of Lisbon Maru families I contacted sent me ‘new’ photos of men on board, and I decided to feature three of the best on this page. At this point I have amassed 151 photographs of those on board. 28 Andrew Furzer kindly sent me a link to an IWM recording of George Bainborough speaking about his wartime experiences, including the Lisbon Maru. 26 Ravi Scout notes that the: “SCMP recently published an article titled ‘French navy memorial in Hong Kong for five sailors who died in great typhoon of 1906 gets overdue restoration’, about a heritage monument which is presently located within Hong Kong Cemetery: the ‘La Fronde’ obelisk. The Consulate General of France is organising a ceremony to unveil the renovated memorial at Hong Kong Cemetery in Happy Valley. The event is at 11AM on 05 July 2018.” While not of course a Second World War monument, readers may still be interested. 23 The first Lisbon Maru documentary advertisement appeared today, on the back page of the Telegraph. The next will appear in The Times on July 9. 22 Martin Heyes notes that he has found for sale in the UK: “the medals of Pte. Albert Leonard Edward of the 1st. Bn. Middlesex Regt., who was wounded and captured on 25 Dec 1941. He died in captivity in early 1942.” He can put any interested party in touch with the vendor. 22 My copy of Stranger In My Heart arrived! I have some long flights coming up soon, so will read it then and review it in the July edition. 21 The latest edition of The Java Journal, newsletter of the Java Far East Prisoner of War Club 1942 was published today. 19 Mary Monro kindly sent me a few photos from the launch of her book Stranger In My Heart, in Bath. I believe it will be featured in the South China Morning Post Magazine on Sunday 1 July. 19 Henrique Gonsalves’s (HKVDC) nephew got in touch. 19 Brian Finch very kindly sent me a copy of Captain Man’s, Middlesex, papers. At first glance I believe they will answer many questions. 18 In creating my gold standard database of the complement of the Lisbon Maru, today I finished processing the first 100 photographs of those who were aboard. I made a little montage of them as they seemed quite impressive on my computer screen! I’m not quite sure how many more I have in my files, but my guess is another 50 or so. (And to find them, I have to trawl through tens of thousands of image files, and tens of thousands of emails). 15 Laurel Films today sent me the latest version of their newspaper advertisement, which I helped edit for them yesterday. 11 Norman Cuthbertson, Royal Scots, who was on the Lisbon Maru and died in Japan apparently had a fiancée in Hong Kong called ‘Peggy’. Does anyone know who she was? 11 The HKVCA’s latest edition of their newsletter is out. 8 Steve Denton kindly sent several files relating to Peter Moddrel, James Stewart Fancy, and Clifford George Webber. 8 While looking for a particular name, I went through the whole of RAOC WOII Fred Walter Bell’s amazing diary again. There are so many great pages there that I was originally planning to feature my three favourites this month, but in the end – as the Lisbon Maru rather dominated things – just chose one featuring a note by the RN Chaplain Charles Strong. 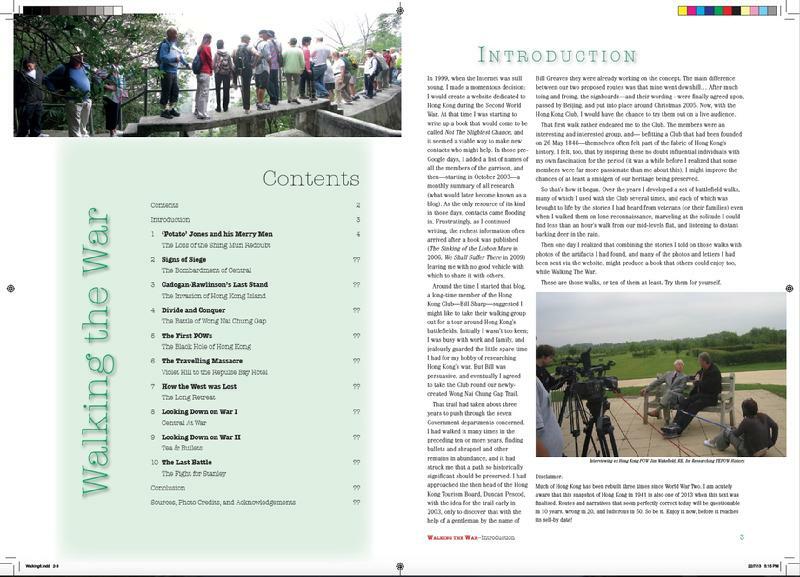 7 The Taiwan POW Camps Memorial Society’s Spring-Summer newsletter has been published. 6 On the HKVCA facebook page, Colin Standish posted: “Our Hidden History... in my possession: When in Hong Kong this past February I noticed a gravestone which had a name I recognized. Alfred Wonnacott. It appears I have some dog tags from a man who died in the Battle. I do not know how my Grandfather came to have them. My family has had them since 1941. For 77 years. I called some of his relatives out-of-the-blue, spoke to them and will hopefully return the dog tags to them. 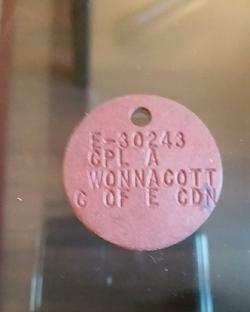 It is incredible what stands the test of time…” CQMS Standish would of course have been responsible for returns, and would have been the right man to hand such dog tags to; my guess is that those responsible for Wonnacott’s original burial on Stone Hill gave Standish the tags in camp. 4 I took the day off and spent the whole time with Laurel Films, meeting their boos (Fang Li) and directors and discussing – both in our home and in Stanley – their ideas for a proper documentary about the Lisbon Maru. We came to an agreement, and I am signed on as a voluntary co-producer. They have access to needed funds, and seem serious. 3 Steve Denton kindly sent me the POW Index Card for Coder Peter Paget, RN. It is the most complex I have yet seen from ex-Hong Kong POWs, with at least nine changes of POW camps. 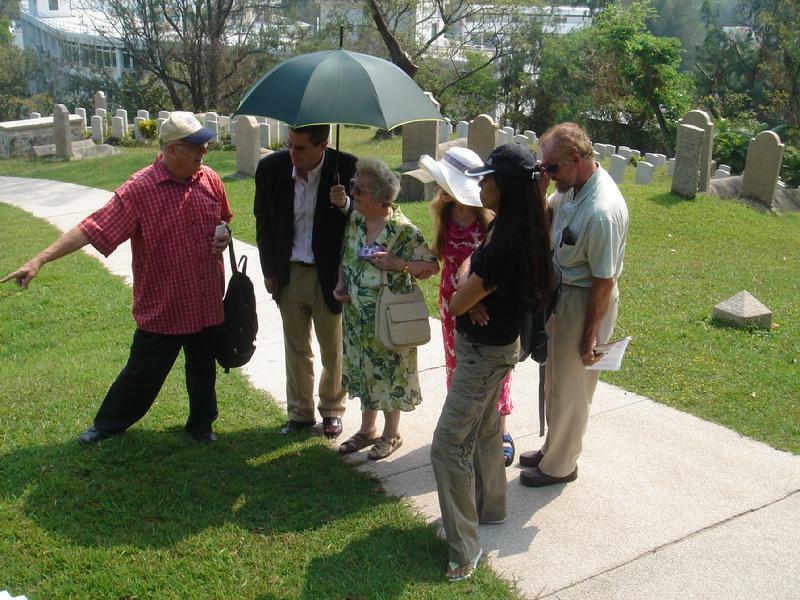 2 I was interested today to see a Hong Kong story on the CWGC web site. I am in touch with the Ablong family. 2 Elizabeth Ride, knowing of my research into civilian refugees into Mainland Chine kindly sent me the pages from the National Archives WO343 covering the ex-British forces Hong Kong people received by BAAG. 2 Today I received a complete list of all British Merchant Seamen captured by the Japanese. 1 I am working on a paper for the Royal Asiatic Society on the reduction in Hong Kong’s civilian population, between December 1941 and the end of August 1945, of around one million people. It seems odd to me that no one seems to have addressed this before. 1 Philip Cracknell has published an interesting account of the Tai Wai bunkers. As our younger son is currently studying in that part of Hong Kong (Island School is temporarily Mainland School…) it’s of particular interest. Whatever happened to Hideo Wada? He was the Japanese officer who the Lisbon Maru’s captain accused of ordering the hatches battened down as the ship sank. He also ordered the shooting of the first men to escape the vessel. And a few months before the Lisbon Maru he had ordered the shooting of four Canadian POWs, Sgt. John Payne, Lieutenant Corporal George Berzenski, and Privates John Adams and Percy Ellis who had been caught escaping. The Japanese medical officer Saito remembered that: “the four Canadians were lined up and shot under the command of Lt. Wada. I think they were blindfolded at that time. Also as I saw it their hands were tied behind their back. The riflemen were standing at a place on a higher level than the place where stood the four Canadians. The distance between the place where the riflemen were standing and the place where four Canadian were standing was about 5 meters. I think that Lt. Wada gave the order to fire, the riflemen aimed at the hearts of the POWs, immediately after the firing the four POWs fell down, then a short time later I went to the four Canadian to see whether they were dead or not. After I found out that they were dead I reported this to Lt. Wada, he ordered one of the soldiers to have the bodies buried on the spot.” (See the 8th for the source of this quote). He was also, I suspect, responsible for the shooting of four of the seven British POWs who escaped at the same time. Oddly enough, in the latter half of the war he was one of the better remembered POW guard officers, but he certainly would have been tried as a war criminal had he survived. However, it is generally accepted that he died right at the end of the war, or even after the Japanese surrender. Was he lynched? Did he commit suicide? (Apologies for the late posting of this month’s blog. This was caused by an operating system error on my iMac on May 31, which necessitated the restoration of a terabyte of data from backup). 30 Jessie Rachel Taylor’s (Stanley internee) great grandniece got in touch. 29 A correspondent asks: “Do you know the meaning of TOPS in relation to Royal Navy in Hong Kong in 1940?” I don’t. Can anyone help? 29 Nona Langley posted a collection of Donald Bowie's papers to the Battle of Hong Kong facebook page. Most of this was familar to me, except an interesting letter from the Japanese medical officer, Saito (or 'Saitoh' here), explaining the loss of POW medical histories and papers. 27 Steve Denton kindly sent me John Maher’s two-page account of the sinking of the Lisbon Maru. In part, he noted: “I swam for 10 hrs until I reached a small island. On reaching the shore I was just in time to see Major Officer of the R.A.M.C. getting battered to death on the rocks.” Many men reported seeing this; clearly, even by the standards of their experiences, it was traumatic. Steve also managed to sort out the drafts of five of the eleven men in my records who are simply marked as TJ (To Japan) because the original Shamshuipo records were too damaged to tell which draft they were on. Following his lead, I was able to find which ships five of the others were on – leaving just one to complete. However, as that one was a professional criminal who enlisted under a false name to escape justice, it may be hard to resolve! 26 To help with some research I am currently doing, Elizabeth Ride very kindly sent me a copy of Volume VII of her invaluable work on BAAG. 24 Dave Deptford sent me something unique today, an auction entry for Ma San Auctions Bath (specialist orientalists): A Chinese 18th Century Qianlong vase allegedly presented to C. Coull Sgt A126 enlisted HKP in 1939, who was a Stanley Internee. Estimated price, GBP20,000 plus! 23 Today I received a very interesting approach from another documentary making company. I will post updates on this site as the story develops. 23 Bill Lake kindly sent me a copy of the MBE citation for Captain John Carvell, for service as Garrison Engineer, DCRE Perak, 1956-1959! 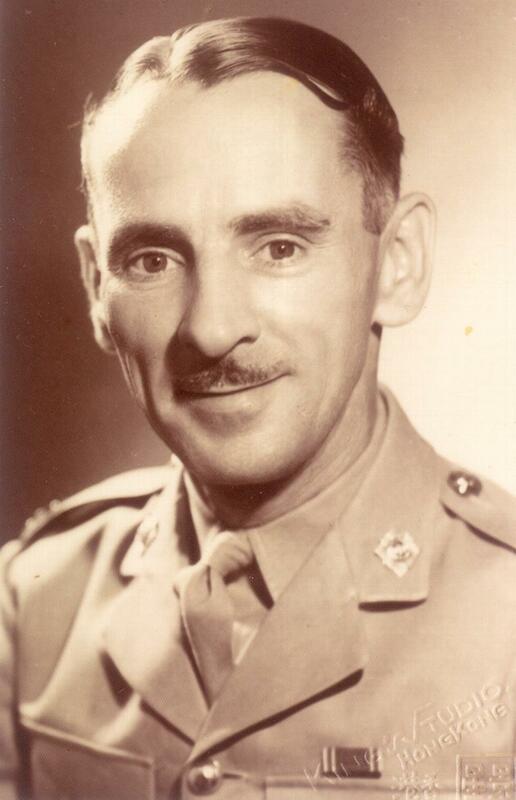 Carvell had been an RE Sergeant in Hong Kong during the war, stationed at the Bowen Road Military Hospital when it was used as the POW hospital. I am currently recording all the wartime awards and decorations, but I don’t know if it would be practical to find all the post-war ones such as this, tempting though it is. 23 Ron Rakusen, son of Manassah Rakusen of the HKVDC Pay Detachment, got back in contact. Ron – just in case you read this, your email system is rejecting mine! 22 Today I had formal contact from Laurel Films, who are working on the Lisbon Maru film project. Hopefully I will be meeting them in Hong Kong early next month. 14 Lionel Bolland contacted me. He is part of the well-known Witchell family. His mother was secretary to Charles Drage (head of MI6 in HK until he moved to Singapore shortly before the invasion). She moved with him, but the rest of the family stayed in HK and were interned in Stanley. His aunt Norah married Desmond Stutchbury and lost her life in a post-war communist ambush in Malaya in 1950. And another aunt, Violet May, married Professor Lindsay Ride of BAAG fame. 11 George Boote kindly alerted me to the sale of Sergeant Harman’s trunk (which now appears to have been removed from eBay). Although the context implied he was a Hong Kong POW, he does not appear in any of my records. Perhaps he was involved with the Japanese POWs rounded up after August 1945? Last time this item was sold, no connection with HK or POWs was mentioned. 10 Yet another American one thousand pound bomb was found in Wanchai today. This one was apparently especially tricky to disarm, but as usual Tony and Andy and the boys did the job with their typical skill.
. Can anyone help with the identity of Private B? The other known members of these two sections were: Private Luis Antonio Barros, Private Thomas M. Castilho, Private Alberto C. Soares, and Private Francisco M. Soares. 9 Keith Andrews kindly sent me the POW Index Card of Robert Harvie, Royal Scots, showing that I had spelled his name incorrectly on both this website and the Lisbon Maru one. I have now corrected both. 8 Following from last month’s discussion about the possible finding of remains in a Shouson Hill well post-war, TK Wong notes: “They could be Br. or Canadian. Even their numbers were not exactly known. Page 115-page 117 of a PhD thesis by Mark Sweeney (U of Waterloo 2013) mentioned the incident. The title of the thesis is THE CANADIAN WAR CRIMES LIAISON DETACHMENT. It has a picture showing a man of the CWGC checking the well where the bodies were dumped.” The text stated: "The final geographic stage of Puddicombe’s case homed in on two incidents near Deep Water Bay. The first involved the killing of three officers at Shou Shan Hill and second the slaughter of a company of Winnipeg Grenadiers at Little Hong Kong. Puddicombe had a local Chinese farmer describe to the Court the murder he witnessed and then take everyone to the location where he claimed the bodies were dumped. Lai Kwong testified that he saw Japanese soldiers lead three European officers from a residence on 25 December. Lai described the scene: 'the Japanese soldiers took the officers to this place, and then they shouted, one – two – three - and made the officers raise their hands and then they swung their swords - as I demonstrated - and slashed it into the officers body.' Lai showed the Court the well and gully where the soldiers had disposed of the bodies. Defence counsel Mr. Sakai cast considerable doubt about Lai’s story and character. He underscored variances in Lai’s statement and testimony, including the number of Japanese soldiers involved and the weapons used in the killing. Lai also claimed that the officers had worn crowns on their shoulders, and that the man thrown down the well had worn a gold ring on his finger. Major Cross of the 14th WCIT testified they found neither ring nor crowns when they exhumed a skeleton from the well, but they had found British .303 ammunition clips and empty corned beef tins. Further muddying the story, the medical officer who examined the bones declared that they 'were those of an oriental,' basing his opinion on the smaller size of the bones. Another defence witness, Captain Diggens of the Graves Concentration Unit, noted that investigators had also found Japanese bullets in the well, and that he and the Medical Branch of Land Forces, Hong Kong believed the body in the well was Chinese based on the weight of the bones and the bridge of the nose. Puddicombe sought to dispel the notion that the body was not an Allied officer, arguing that the presumption of heritage based only on size was worthless legal evidence. He noted pithily: ‘there are small Europeans. This Court has had before it on one or two occasions, a certain Lt. Col. of the WINNIPEG GRENADIERS who is certainly no giant.’ "
7 Today I accompanied Rear-Admiral Gilles Couturier (Deputy Commander of the Royal Canadian Navy) Commander Christopher Nucci (the captain of HMCS Vancouver), and a dozen or so other officers to the Sai Wan war cemetery for their formal wreath laying. Dr James Boutilier also accompanied the party, and we stopped and spoke about a number of graves as we passed by – including those of the four executed Canadian escapers. 7 Richard Moddrel (son of Peter Moddrel, Royal Corps of Signals) kindly sent me photos of his father’s medals, together with the formal Records of Awards in his pay book (or, more formally, Army Book 64, Soldier’s Record and Pay Book). 5 Steve Denton raised an interesting question. In my HKRNVR files I list a Sub Lieutenant W. Petro. Steve has shown that his full name was probably W. Petro Pavlovsky, though as yet I have been unable to find out anything more about him. 5 Martin Heyes kindly sent some photos from last month’s talk on Reduced to a Symbolical Scale. 4 The Canadian Consulate kindly invited me to the deck reception aboard HMCS Vancouver this evening. The weather was a very overcast and humid and I admit I was sweating under my suit on the crowded ship! 3 Based on a very helpful suggestion from Henry Langley, I have updated the tabs on the left hand side of this page, The Books. I have added a page for Reduced to a Symbolical Scale, and also updated the ‘Future Research’ page. Over the last few years the pressure of work has necessitated that I just update the monthly blog on a regular basis, but I must do more to keep the remainder of the site in shape too. 3 I gratefully received a very interesting copy of a report by Cyril Bucke, giving a great deal of data on the Lisbon Maru deaths post-sinking, and the fates of all officers aboard. Had I had this in 2006 it would have saved me a great deal of research! 2 Philp Cracknell has a very interesting new post about Group Captain Thomas Horry was commanding officer RAF, Kai Tak until Sunday 7th December, when he handed over command to Wing Commander Ginger Sullivan, and sailed out of Hong Kong on the ill fated SS Ulysses to take up a new role in RAF, Singapore. My research revealed he was a WW1 Ace with eight accredited "kills" and the holder of the DFC and AFC. 1 Ronnie Taylor (UK) kindly sent me a photo of Edward Phillips (Middlesex, illustrated), who was lost in the Lisbon Maru. 1 Steve Denton kindly pointed out that Richard Alderbridge (see last month) was simply a figment of my poor typing. His real name was Richard Aldridge, 8th Coastal Regiment RA, and he actually was part of the Hong Kong Garrison. While I have no special interest in medals, it has always struck me as odd that no one (to the best of my knowledge) has created a full register of all the awards and decorations relating to the Hong Kong campaign and the POW years that followed. So I have started to compile one using both the London Gazette (for official announcements) and WO373 (for recommendations) as sources. Where possible I intend including the current location of medals, or any details of sales that I am aware of. I have 284 on the books so far, but don’t yet know what percentage that represents of a whole. Interestingly, it’s a pretty diverse list. Every unit involved (from nurses through to pay corps) seems to be represented. 30 Just in case anyone sees this in time, the St Stephen’s College Heritage Trail is having an open day on Tuesday May 1. 29 I went for my usual walk in the hills today, and I’ve never seen the watercourses so parched. I suspect this has been the driest April on record. The waterfall on the Peak has water (and a few tadpoles turned up about two weeks ago) but all the others are virtually dry. 28 This evening, thanks to a suggestion from Martin Heyes, I gave my first talk about Reduced to a Symbolical Scale. Originally I had expected it simply to be for the OMRS, but happily the RAS also became involved, and Gwulo, and thanks to Ron Taylor and the Volunteers the venue was their Club Room at the Happy Valley Stand. Rather than the seven or eight people I had expected we had over forty and it was very enjoyable. Instead of just talking about that book, I tried to put in the context of the other books I have written and hopefully will write, and after I had rambled on for forty minutes or so there was an interesting discussion about various facets of the evacuation. 28 Angela Swanney, who first contacted me in 2013, kindly sent some pages from the diary of Corporal Douglas Thomas Smith, HKVDC, who was at Shamshuipo and Nagoya #8B. 28 Barbara Anslow reports that she has received the proofs of the book of her diary, provisionally entitled Tin Hats and Rice. I will of course announce publication details later. 26 Alan Knight notes that he: “recently visited Bredwardine in Herefordshire, to which my mother was evacuated in 1940. In the small church was a memorial plaque with three names on it. One was ‘Sgt. Stanley Musto. Drowned as a Prisoner of War in Far Eastern Waters (1942)’ ”. Musto was of course in the HKSRA and was lost on the Lisbon Maru. Alan kindly sent a photo of the plaque. 25 Tan kindly sent this very high-quality newsreel excerpt about the liberation of Hong Kong. 25 The wartime Hong Kong facebook page has been discussing the incident in which a British soldier’s body (possibly an officer’s) was thrown into a well at Shouson Hill. There were some reports of this in the papers in 1947, but does anyone have any more detail? 24 A Major’s Crown was found in the hills today. Interestingly, we may know exactly which major this belonged to. More on this as it develops. 23 Mary Monro reports that Stranger in my Heart, covering her father Major Monro’s experiences as an escaped Hong Kong POW (among other things) should be available in June. 23 Bill Lake reports that: “Yesterday I was taken to the East River Guerrilla Museum in Dalingshan, Donguan by the history section of the East River Group and Dave Kerr.” It sounds very interesting. 22 Steve Denton kindly sent me a complete copy of Homeward Bound, the official publication of the POW repatriation voyage of the USS Joseph T. Dickman (APA13). I already had a copy of the cover, but not the contents. 21 Went up to Magazine Gap this morning, and finally pretty much found the right place for the car photo. I don’t think there can be any real doubt that these are the cars mentioned last month (“On the 20th (of) December, [George Palmer], his Chinese driver, in the front seats, and [Eddie Hyndman], safely in the back seat of their staff car, made their way under fire from Japanese planes to the Peak. When they arrived at Magazine Gap Road they received heavy strafing from one of the planes, followed by a bomb which hit the back of the staff car. George and the driver were blown free… and landed on the road, unhurt... but poor Eddie… received severe injuries and was rushed to the War Memorial Hospital.” He died of his wounds eleven days later.) The position is the corner of Magazine Gap Road and Peak Road, outside number 40. 21 Conner Hackett, via Phillip Cracknell, sent a photo showing ex-Stanley internees boarding the Empress of Australia from Stanley Camp. It’s the first such photo I have seen. Philip also sent another photo of Postbridge – apparently just after it was built in the late 1930s. This is only the second existent photograph of the house that we know of. I’m glad to report that the Lisbon Maru families who Fang Li and his crew have interviewed are so far unanimous in reporting positive experiences. 16 Philip Cracknell has two nice new articles on his blog, relating to very well known Hong Kong wartime figures: Major J.J. Paterson, MD of Jardine Matheson and Commanding Officer of the Hughes Group, HKVDC, and Lt-Col Eustace Levett, Chief Signals Officer - China Command. 15 Today I happened to see again the well-known Canadian post-war photo of Stanley Gap. For the first time I realised that the concrete stove (the square shape just above the words ‘up to’) of the ‘black hole’ was still undamaged at that date. Today – aside from the trees that are now all over the site – the structures look much as they do in this photo, except that the stove is badly damaged on the far side. I had always thought that damage was done by a shell, but obviously not. 15 Steve Denton kindly sent me a copy of the COFEPOW newsletter for April. It included lots of letters about Fang Li and the Lisbon Maru. I hope to meet him in Hong Kong in May. 14 First thing this morning I charged up Chatham Path today to get to the junction of Barker Road and Peak Road to photograph the location of the picture of the destroyed cars. All went well until I returned home and eventually realized that the pictures I had just taken didn’t really align. I was too far west; the position that I had thought was the end of Barker Road must really have been Magazine Gap. I will have to try again later. 12 Cortia Chung at St Stephen’s College notes: “Our Heritage Gallery has received a donation of memory box including some medals of Lance Serjeant Murray Thomas Goodenough (Royal Rifles of Canada). Mr. Goodenough was born July 5, 1925 in Quebec’s Eastern Townships, and died on December 22, 1943 in Japan. He is buried at Yokohama. The son of Tom and Hilda Goodenough, he was the youngest Canadian soldier in the Battle of Hong Kong. Before he was taken prisoner of war at Stanley when Hong Kong fell on Christmas Day in 1941, he had been wounded twice at Sugar Loaf Hill. He was 18.” I contacted the family and discovered that Goodenough’s cousin’s niece had donated the medals. Cortia wanted assistance in identifying them and finding the citation for Goodenough’s Military Medal, so I asked the OMRS for assistance. They reported the medals as being: Military Medal (King George VI) 1939-45 Star, Pacific Star, Defence Medal 1939-45, Canadian Volunteer Services Medal 1939-45 clasp Hong Kong, and War Medal 1939-45. I then downloaded the citation from the IWM’s website for a small fee. As I had suspected, the MM was for his recapturing of two Vickers Guns that had been lost to the Japanese on Sugar Loaf Hill. 11 Five live Japanese grenades turned up today off Sir Cecil’s Ride. Two surprising things: firstly, I used to walk all over that path thirty years ago, picking up all sorts of things (before it was paved), and then when the metal detectorists arrived I told them to try that path and they found a whole lot more (grenades, mortars, fuses, water bottles, canteens, live ammunition, spent bullets, cartridges, shrapnel, buttons, and at least one helmet); after all these years I thought all had been found. And secondly, it wasn’t reported at all in the mainstream media. I guess that all the recent news of huge American bombs being found makes tiny little grenades like these seem irrelevant! 10 My copy of ‘Oh, Silent Cross’ arrived. One chapter of this large volume concerns Sergeant Robert Lytle, Winnipeg Grenadiers, but also has a lot of information (almost one hundred pages) on other Winnipeg Grenadiers and the battle as a whole, presented in what I would describe as a ‘scrap book’ style. 9 Kai Lau-Thomas, whose father was Lau Yam Choi (a veteran who became well-known in the Hong Kong police post-war), got back in touch. It seems that Mr Lau was in BAAG, and I am trying to work out where he is in my records. That can be a challenge as the transliteration of Chinese in those days wasn’t standardized, and also sometimes British-style Christian names were used instead of Chinese. Matching names from the period is often challenging. 6 Sylvia Midgett put the well-known picture of strafed cars somewhere near the Peak on the Battle of Hong Kong facebook page today. I have been looking for the location of these for some time, believing the photo to have been taken somewhere on Barker Road looking up towards Magazine Gap, but James Barnes identified the location as near Magazine Gap itself, looking west towards the Peak. I will have to go up and have a look. That spot is no more than thirty minutes walk from where I live. 5 Frazer Smith, son of Elmer Smith (Royal Rifles of Canada) got back in touch, kindly sending me copies of a number of documents relating to his father. One was a photo of Sai Wan Cemetery taken in 1980, nine years before I moved to Hong Kong (Illustrated). That was just before all the tall buildings between the base of the cemetery and the sea were built, and it looks more like it did in 1947 when it was first established. Elmer Smith lost his cap during the battle, and remarkably it was returned to him by Clyde Cook, the son of Mrs. Archibald Cook, when they were repatriated in 1942 – a story which Frazer related in The Advocate of Wednesday, November 7, 2012. Elmer Smith is far right, front row, of the photo here. 4 Steve Denton kindly sent several documents relating to George Henry Calvert (see last month). I am wondering if George Harry Calvert really existed, or was simply a product of poor administration. 4 The Hong Kong Museum of History got in touch, asking the source of the Japanese propaganda leaflet which I out on this website last month, as they would like to feature it in an exhibition. The source was Colin Standish, so I put them in touch. 2 Percy Suckling’s (Stanley Internee) family got in touch. He was Managing Director of the Hong Kong and Shanghai Hotels. Born on 12 December 1890, he was thus 51 when the Japanese captured Hong Kong. He was in the Hong Kong Hotel at the time of surrender, and then held in Stanley Internment camp in room A1/6 which he shared with five others. 1 TK Wong, writing of The Hong Kong Independent Battalion (see last month) notes that the book I referred to: “has a picture of the house which served as the headquarters (actually hiding place) of the Chinese anti Japanese fighters in Saikung area. The ownership of the house had changed since December last year.” The new owner is a relative of TK, and apparently he will not demolish it since the external walls are made of granite blocks instead of cement. He will renovate the building for his own use, and I hope to visit at some point. 1 According to Steve Denton, the R. Aldridge reported on last month was most probably Richard William Aldridge 1058464, Royal Artillery, who was not from the Hong Kong garrison. 1 Martin Heyes took a Norwegian couple to Stanley today. 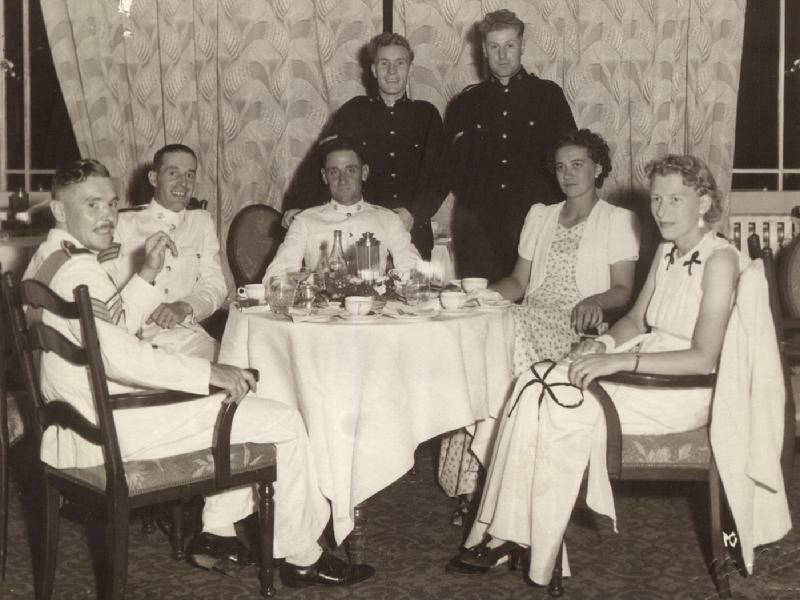 The gentleman’s uncle, Guttorm Stensen, was a merchant navy seaman whose ship visited HK just before the Japanese invasion and initially he was not interned, though later he went into the Camp with other Norwegians. Martin notes that: “We then went to the cemetery and visited the grave of those killed in the Christmas Day massacre in St. Stephen’s College. Whilst there I noticed that somebody had placed the note below with some roses at the base of the headstone of the grave.” The note was in memory of William Parkin, RAMC, who was killed in the massacre. Links to other Primary Sources. William Sprague, Private, HKVDC. (Website).